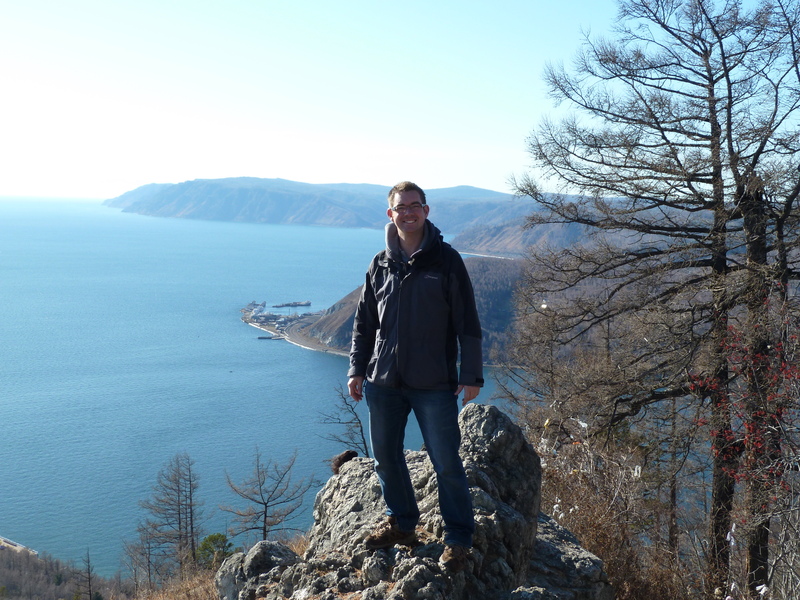 Not what I was expecting to hear from a fellow backpacker as I bundled through the main door of the hostel after the trip to Lake Baikal! 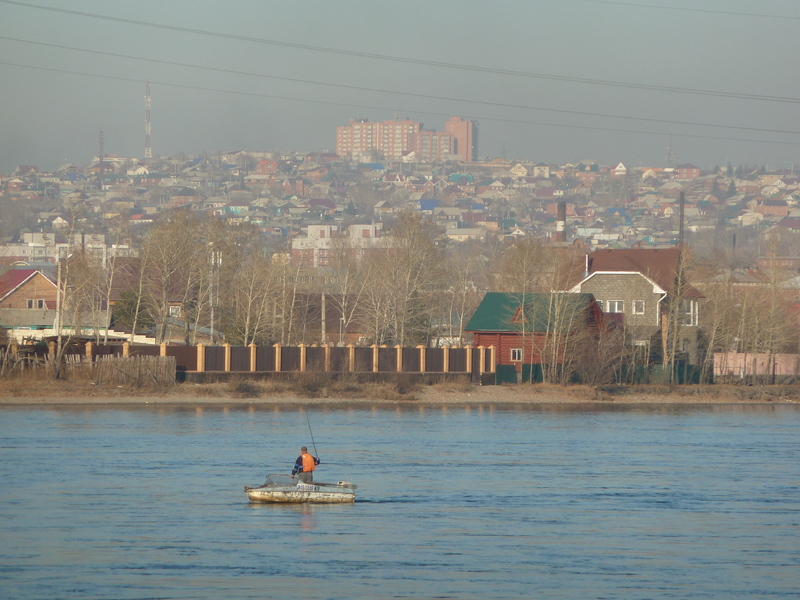 Irkutsk -near the big lake towards the East! 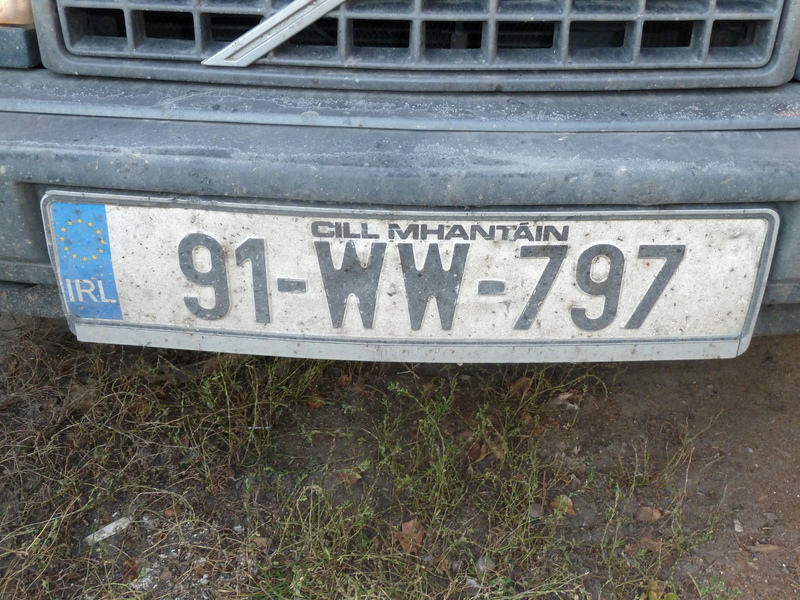 Sure enough, parked up outside was an old Volvo 940, complete with Irish registration plates, an Irish flag sticker and a load of sleeping bags and belongings inside. Its owners are married couple Cameron and Julie, an Australian and an Irish girl. 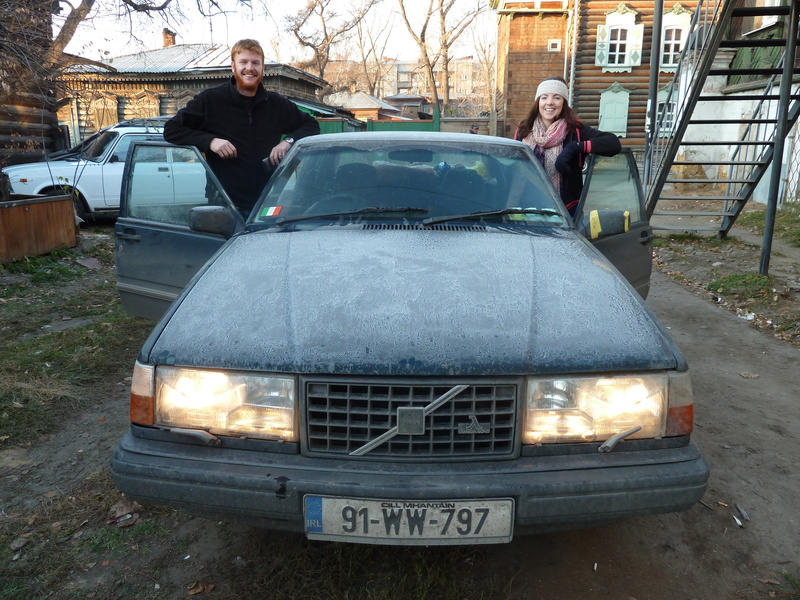 Incredibly, they’ve driven all the way to the far side of Russia from Dublin, having left the Emerald Isle in August. Along the way they’ve stopped off at Stockport to see friends, before making their way to Harwich for a sailing across to Holland, and then driven across Europe, through the Russian border, and after a few weeks battling the crazy way of driving here, managed to reach Irkutsk. Cameron and Julie...and their Volvo! I’m amazed – having thought my trip was a bit of an adventure and ‘off the beaten track’, driving the entire 8,000km in a 1991 Volvo pretty much trumps everyone’s traveller story, and we sit around for a few hours digesting their tales of how the engine erupted into flames at a petrol station, yet somehow still manages to work. Of how they had so much trouble bringing the car through the border. How they’ve been asked for photographs by members of the public with their number plate. And all along, we’re drinking shots of Russian vodka which had been given to them by a well-wishing trucker at their last truck stop, full of praise and admiration for their intrepid adventure. Their story makes me smile, as one of my first ideas when I was starting to think of my trip was to buy an old van and drive it to Moscow, to help save on transport and accommodation costs. I’d have kitted it out with a mattress in the back, much to the amusement of my friends Matt and Siobhan back home. I wouldn't fancy driving in this lot! They had visions of me being arrested in lay-bys somewhere in Eastern Europe. 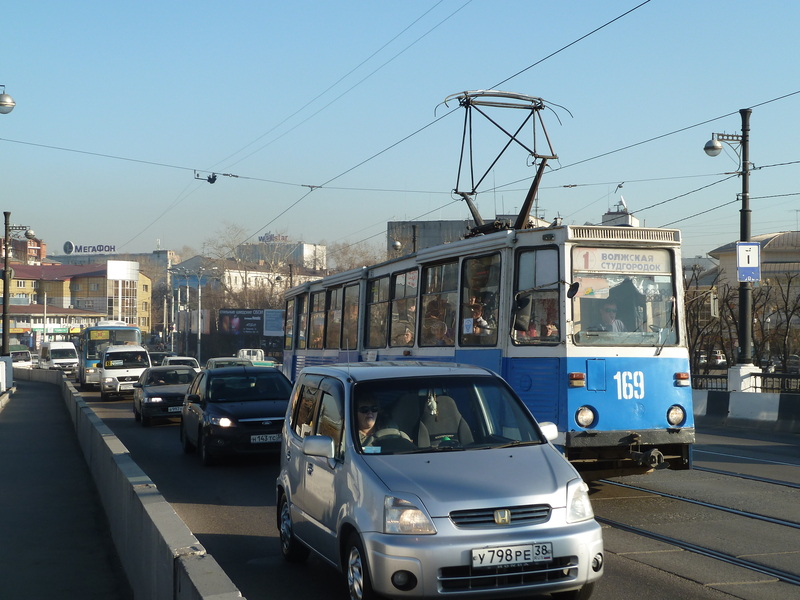 It wasn’t that thought which put me off however – it was the problems with bringing a car into Russia and potentially having to leave it there while the journey continues around the world. It’s a bureaucratic nightmare to say the least- and the Russian authorities are very much against any western cars being left on their soil! 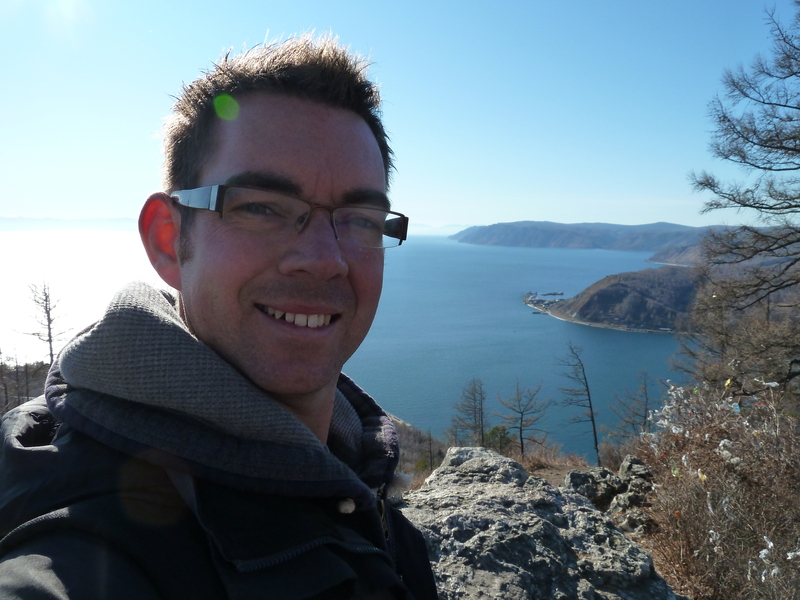 I had an important reason for being in Irkutsk – the small matter of a visa for Mongolia. It was something I desperately wanted to get before leaving the UK, and had planned to make a visa dash to London on one of my days off before leaving, but my Chinese visa application took a lot longer than it should have done – more on that in a future scribbling! Anyway, it turned out that the Mongolian consulate was only around the corner, but when we arrived I was told they could only do a ‘next day’ service. That somewhat scuppered my plans to get a train that night to Ulan Bator, but these things happen. 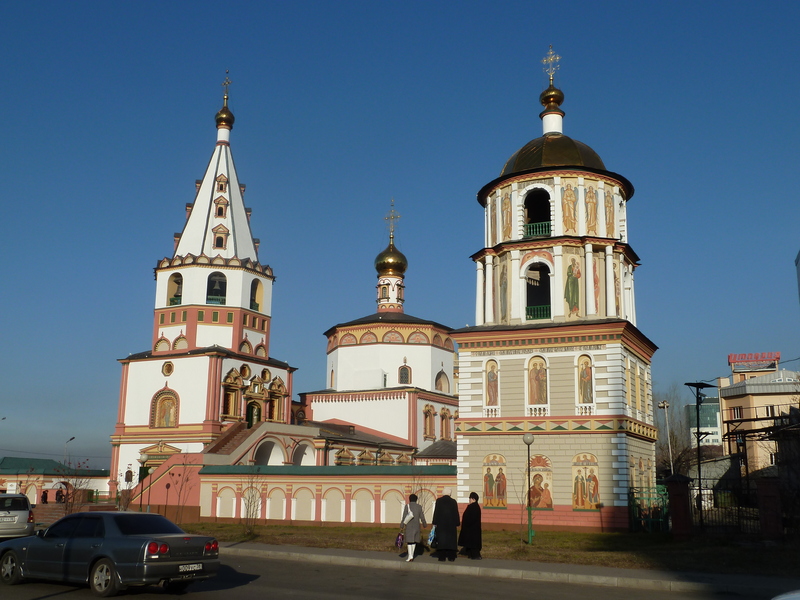 It meant an extra day in Irkutsk, so more time to look around. 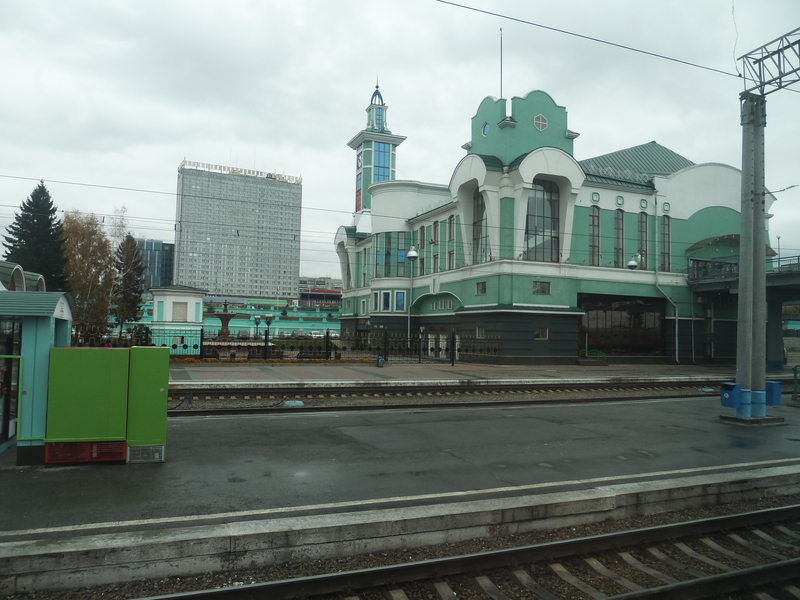 I went back to the hostel and searched for the trains to Ulan Bator the following day. 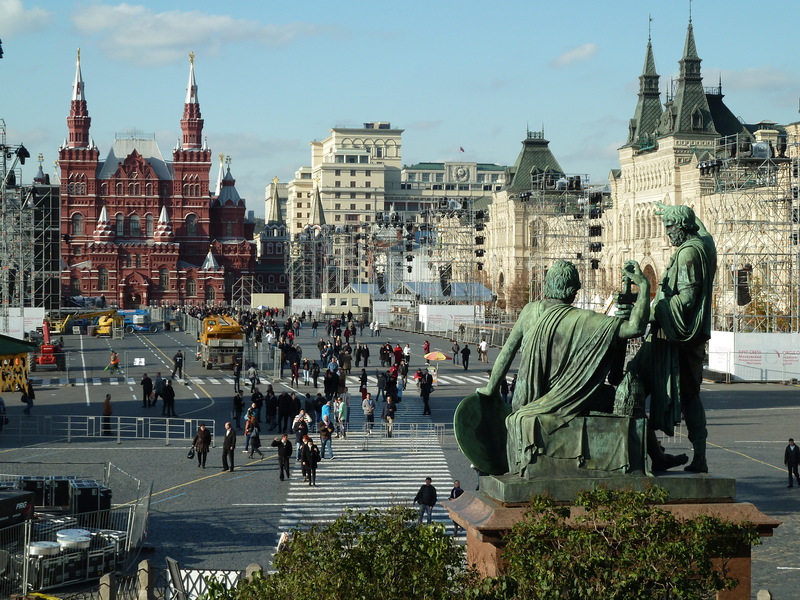 I was quite alarmed to see there was no availability – especially as my Russian visa expires in a few days, so I needed to get out of the country. With a two-day journey to Mongolia, things were getting a bit close for comfort if I had to leave in two days time. By my rough reckoning, the Wednesday train would see me clear the Russian border by a matter of hours, delays not included in the equation. 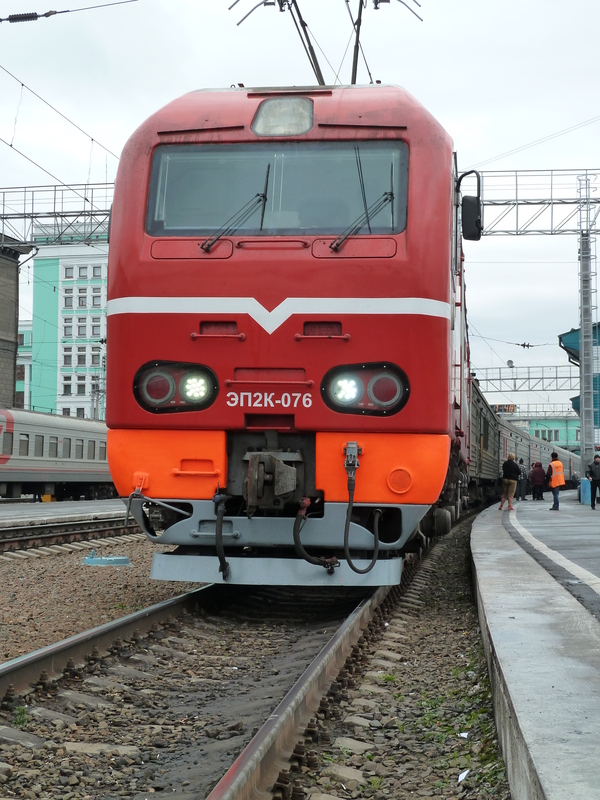 Thankfully, the website was wrong, and a second class lower berth was mine on tomorrow night’s service from Irkutsk to Ulan Bator for 4,600 Roubles, or about £90. I was relieved- it gives me a day to play with on my Russian visa, and I wont have to face the wrath of any angry border guards! Hannah and I went in search of some lunch, which is easier said than done here. Its so hard to spot cafes and restaurants, as there’s very few of them. The Russian view on eating, I’ve concluded, is completely different to that in the West, where its seen as a sociable way to enjoy time, with nice food and good company. In Russia, judging by some of the pre-prepared buffet-style food I have managed to find, its simply a means to an end; a way of staying alive! I’m used to fast food usually being available everywhere you look. So far, I’ve seen just one Mcdonalds sign in Russia, which is probably good for my addiction to the place, while there’s nothing in the way of KFC, Burger King or Pizza Huts, the usual venues for a quick but unhealthy fill. Instead, there are hundreds of little stalls all over the place, selling cakes and biscuits and various breads through a little hatch. My musings have already prompted concern from my parents and on Twitter that I’m not eating properly. The problem is, fresh fruit and veg is hard to buy, and proper cafes or restaurants are few and far between. 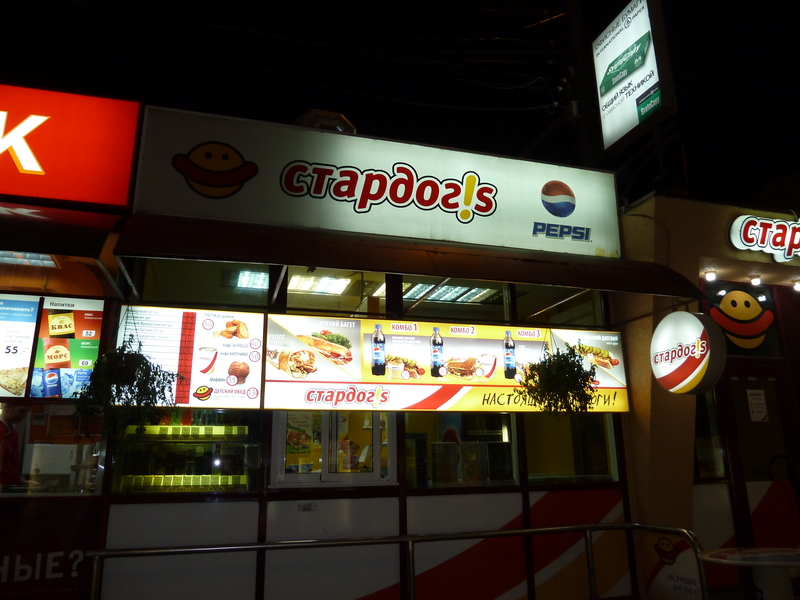 Even when you find them, it’s a game of Russian Roulette – or lucky dip as the travellers call it – running your finger down a menu and hoping for the best. There’s absolutely no way of working out what on Earth you’re ordering! We gave it a good go trying to find something authentic. We looked for a café that was recommended, and it seemed far too pricey. We looked for another in the guidebook, and it had changed into a United Colours of Benetton (still the height of fashion here!) and eventually found somewhere that sells Russian pancakes. We settled for that, hoping for a savoury filling. That was a no-no, as only sweet fillings were left we were told! We decided to have two each, with apricot jam on the side, and laughed about having to have dessert first. The main course was a Subway that we managed to find on the way back to the city centre. Well, we did at least try to be authentic! 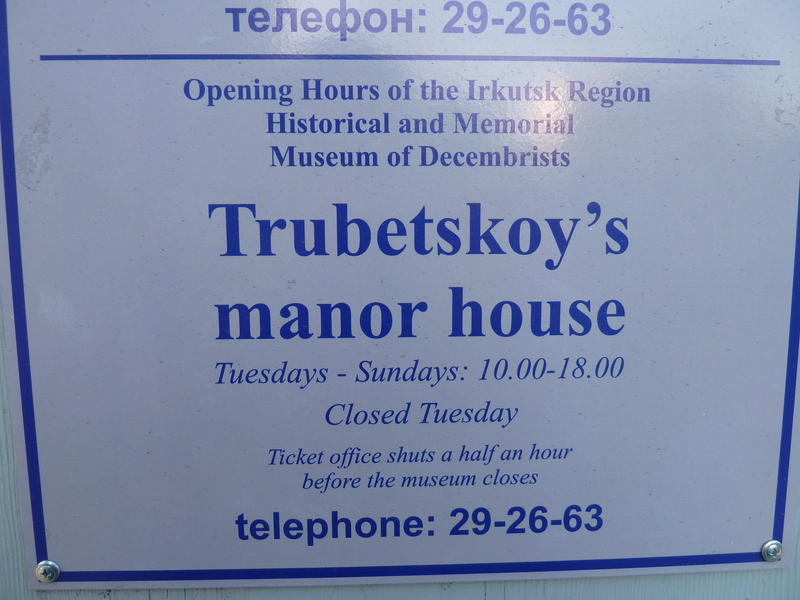 The rest of the day was spent seeing some of the sights, including Trubetskoy house, once home to Sergey and Yekaterina Trubetskoy, who caused a whole load of trouble back in 1825 when they tried to mount a coup, which failed, and so lived here in exile. By far the best thing about it however was the sign on the gate. All I’ll say is I was there on a Monday…I didn’t want to take the risk the next day! 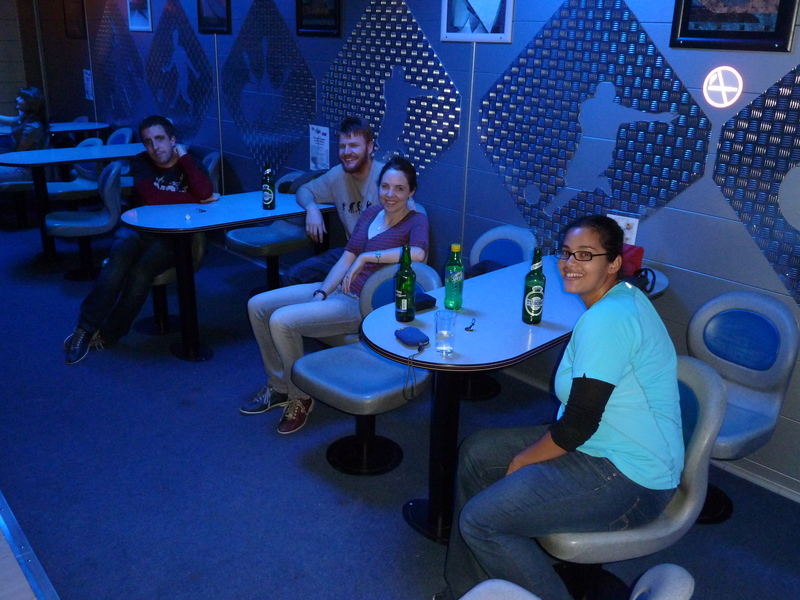 That night a few of us went ten-pin bowling at a nearby complex, which was a lot of fun. The first game was full of male competitiveness between Cameron and I, for the highest score, although his flukey Turkey blew my hopes to bits. 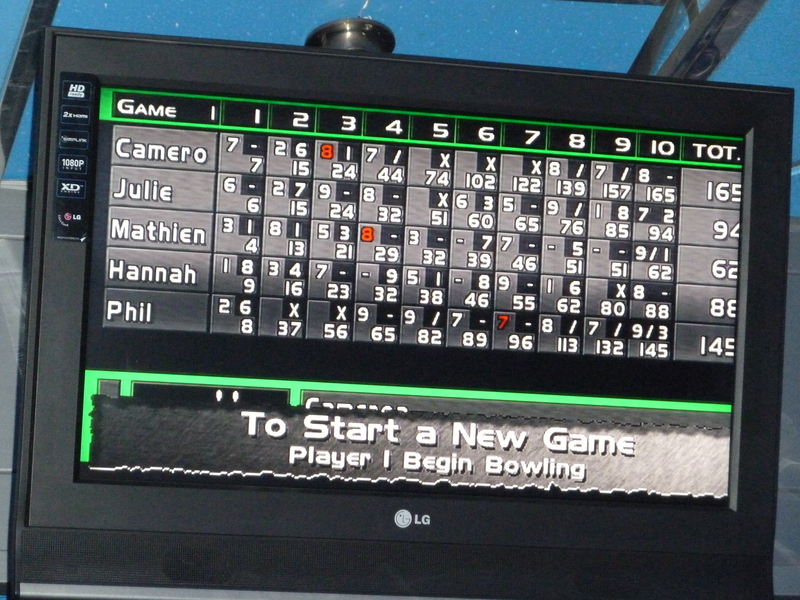 The second game was much more fun – we’d seen the system showed your bowling speed, so invented a new game of taking the heaviest ball and seeing who could bowl, or should I say throw, it fastest! Of course, the 15 ball had really big finger holes, and I dropped a clanger by trying to put all my energy into it, just as it slipped off my fingers and into the air behind me. As we were the only ones in there, the noise surely alerted the staff to our shenanigans. If it didn’t, the next calamity certainly did. 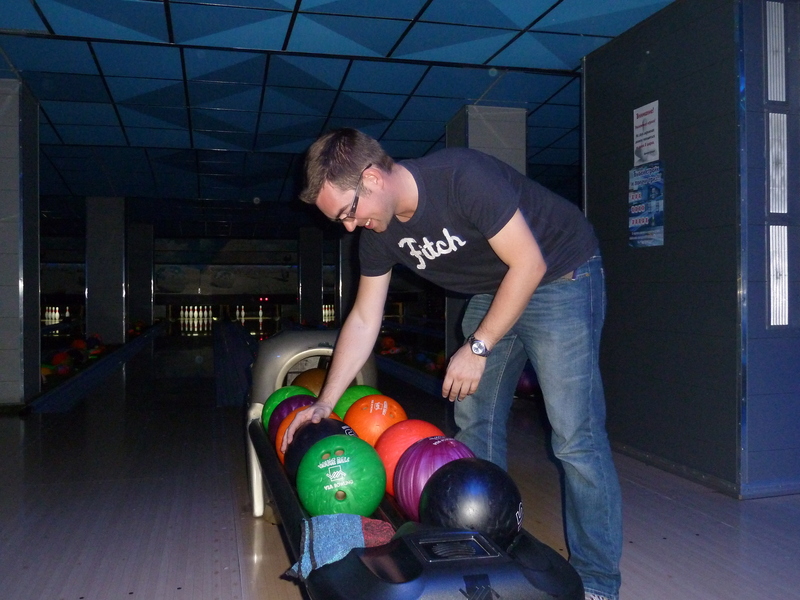 Matieu, a French guy, bowled it as fast as he could, except the machine was still in the process of clearing pins away. We all gasped. We knew what was coming. Time did that weird slowing down thing as we hid behind our hands and cringed, almost wanting to look away, but actually really wanting to see what would happen. BANG. Pin clearing machine was broken! Thankfully, the camouflage-wearing (!) security guards weren’t alerted, the machine was repaired for us, and we finished the game. I won the game, but Cameron won the real game. With a speed in excess of 35km/hr! 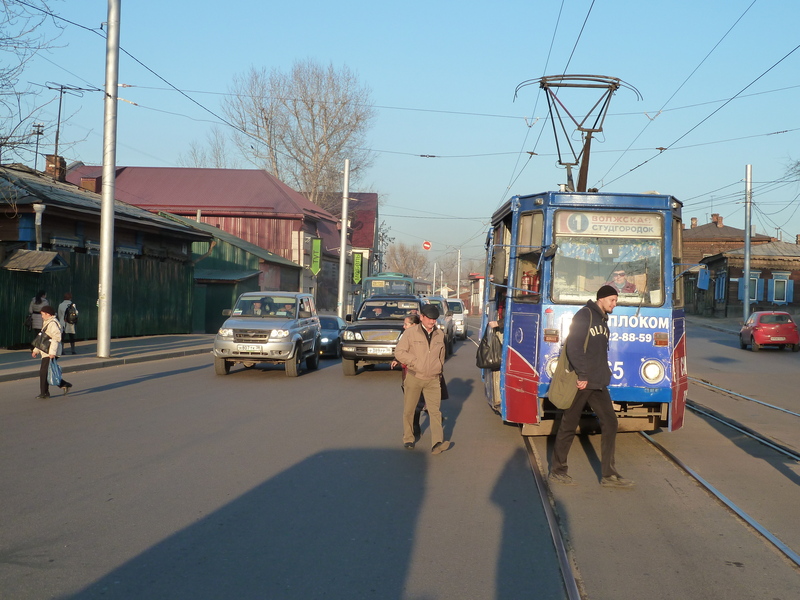 The rest of my time in Irkutsk was spent picking up my Mongolian visa, which set me back $100, and wandering around through the streets of the city. 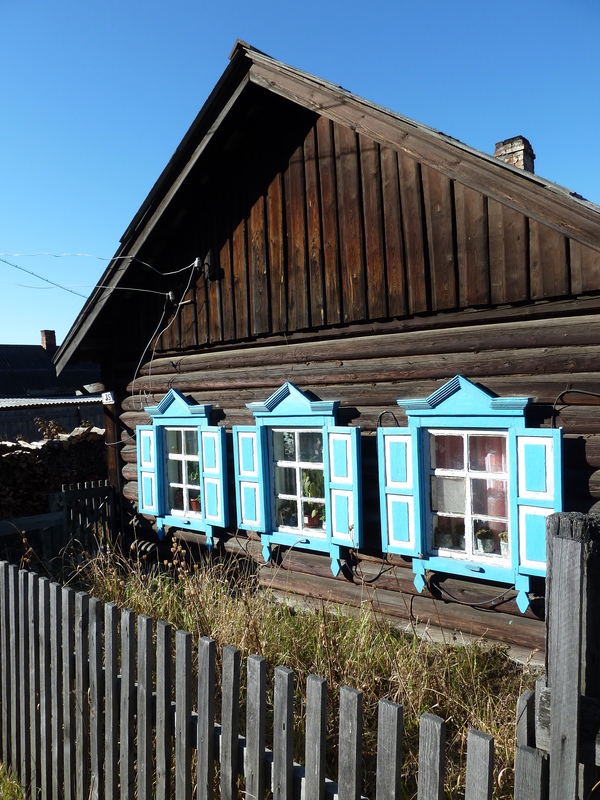 Its called the Paris of Siberia, and with its river, pretty streets, churches and cathedrals, it was easy to see why. I opted for a strange bit of Russian cuisine for lunch from one of the little stalls near the city stadium. The best way I can describe it is as a deep-fryed Cornish pasty containing yet more mystery meat. 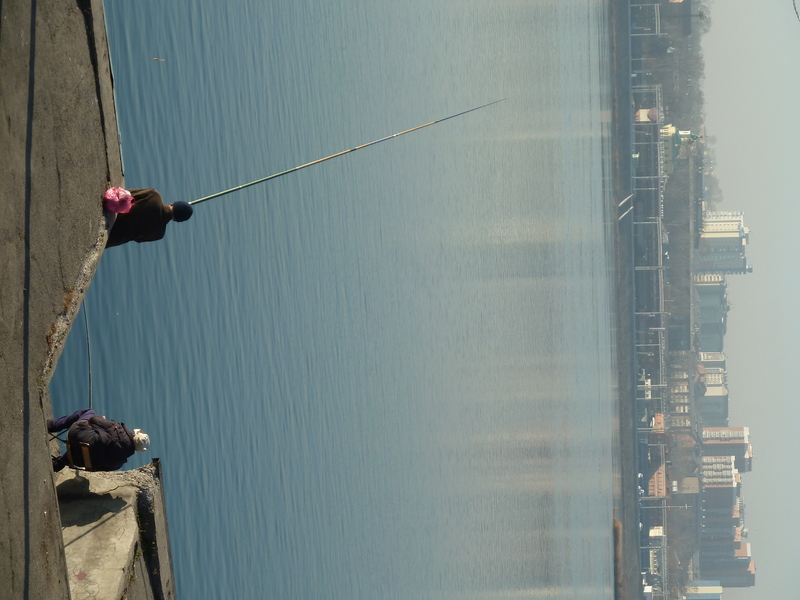 I ate it sat on the banks of the River Angara, near to the Trans-Siberian railway memorial, dedicated to the work of those who built the line I’m travelling on. After stopping at a shop to buy some supplies for the train journey – some bread rolls, cheese, tea and apple juice, it was back to the hostel to pack. There’s a two-night journey ahead, and another country to discover. I woke up in a panic – I knew I’d pressed the snooze button on the phone alarm, and I had the guy who runs the hostel waking me up. 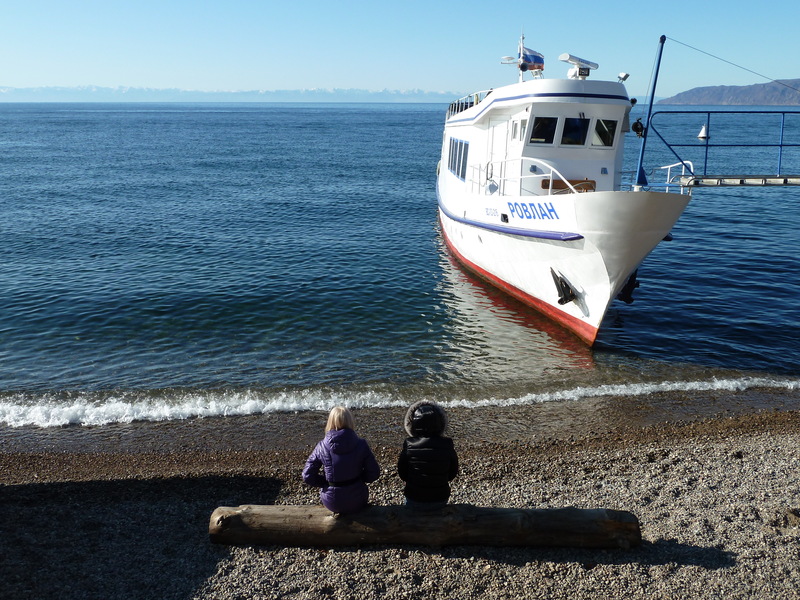 I had a trip organised to Lake Baikal, the world’s oldest and deepest lake, and the pick-up was at 9.50am. Thankfully, I still had 20 minutes to get ready. I’m staying at the Nerpa backpacker’s hostel in Irkutsk, close to the city centre. 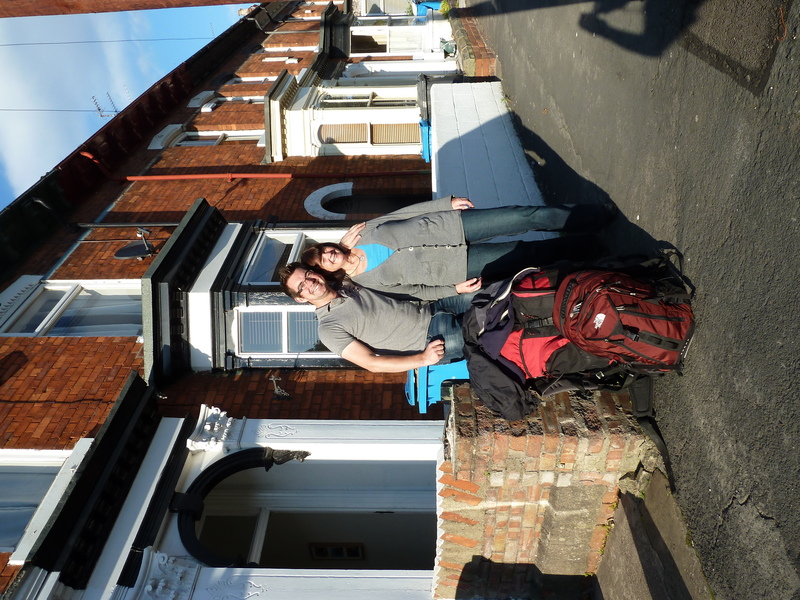 It’s clean, homely and friendly, everything you need when you’re adjusting to life as a backpacker. They’d booked me a trip to the lake after I saw it on the noticeboard, and it was one of my main reasons for stopping off in the town – the other reason being that it has a Mongolian consulate, so I can get a visa for the next country on my trip. I was under the impression that it was an organised trip, and as the minibus turned up, I was quickly taken to the town’s market. An hour later, and the minibus now full of locals, we were on our way to the lake, 60km away. It was a pleasant journey, a couple of passengers tried talking to me and kept repeating the word ‘London’ with smiles and a nod. I kept smiling and nodding back! 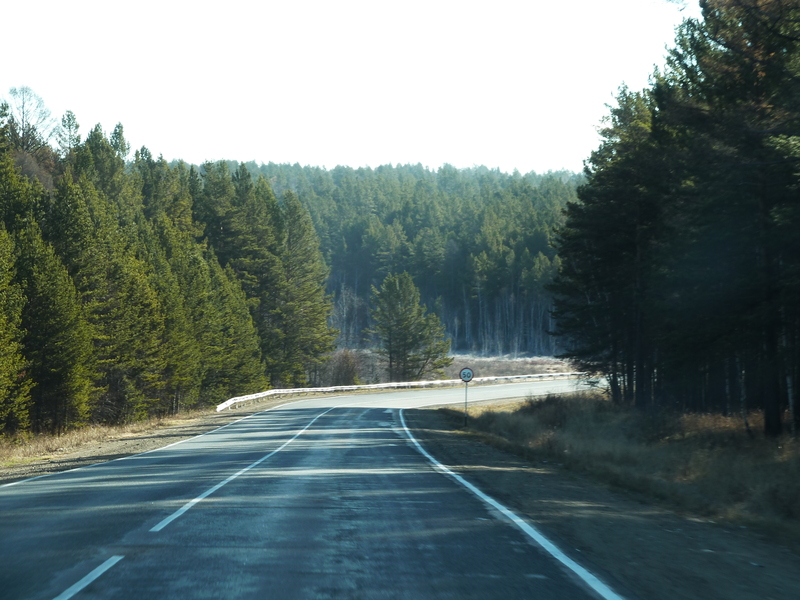 The journey took me through some fantastic countryside – long straight roads cutting through evergreen forests, rolling hills and villages made up of tiny wooden huts, a typical sight in Siberia. It did not feel like the Russia I had imagined – it felt much more like I was in the French Alps. It was about an hour before we reached the lake, stretching out for miles and meeting snow-capped mountains on the far side. We arrived in the lakeside town of Listvyanka, the minibus driver gave me a list of car registration numbers I could get a lift back with, and I went off to explore. Some fellow backpackers told me there was a ski-lift to take me to the top of the hills around the town for a great view of the lake, so finding that was the main objective. I quickly found however that the town was very spread out along the main road at the edge of the lake. I read my guide book on the shore for a few minutes, before deciding to walk to the main village. The water was incredibly clear and blue, lapping onto the pebbly beach. 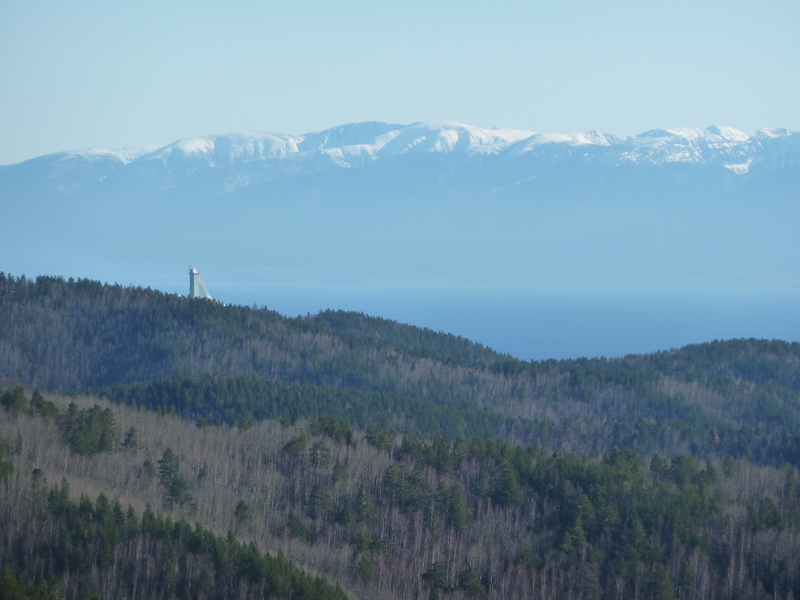 On the horizon, snow-capped mountains, and the borders of Mongolia and China. The sheer scale of the lake is immense – it’s known as the ‘Blue Eye of Siberia’ for a reason. It’s the world’s oldest lake, formed 50-million years ago; the deepest at 1,637m (5371ft) and is among the largest lakes on the planet, stretching 400 miles long and between 20 and 40 miles wide. 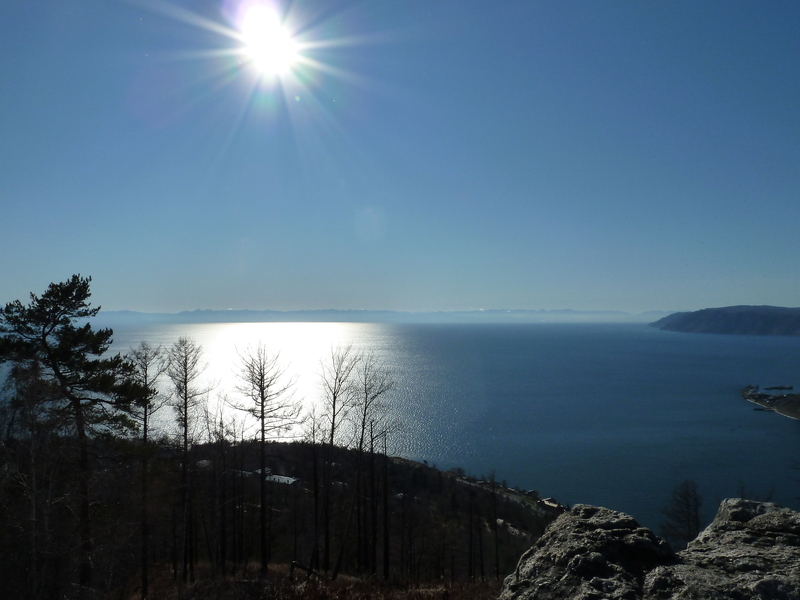 There’s so much water in it, that if everyone’s taps ran dry in the world, Lake Baikal could keep the entire population of Earth going on fresh water for 40 years! And its so clear and clean, that the locals simply put a bucket in and take it home – I even saw one man who works at a diving company filling two cups, presumably for a warming cuppa, straight from the lake. The guide book revealed how it was a nice walk to the town’s church, nestled at the back of the town in a valley. The church, minus its 5-star toilets! Walking through the streets was like walking back in time – people were in their gardens turning over soil, tending to their vegetables, while rusting cars and tractors were dotted around. Most houses are wooden, many are falling apart, but nearly all of them have beautiful painted shutters adorned with carvings. 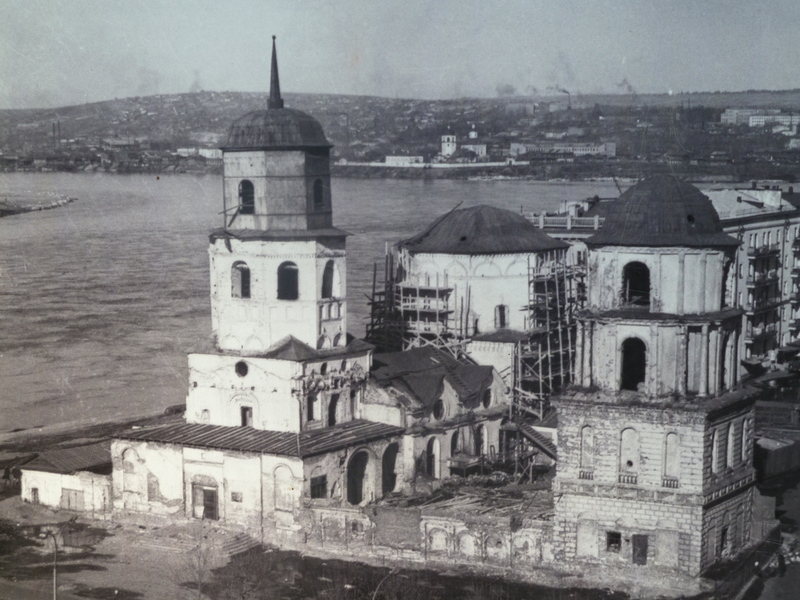 One of the reasons for finding the church was because the guide book told me some concessions had been made for tourists, and that there were some new five-star toilets located behind it. I thought that would be a ‘convenient’ stop after a while travelling, so headed towards them. There were some cheery waves from people as I walked past, and after about fifteen minutes, I found the church…and the ‘five-star’ restroom. Needless to say, I didn’t use it, but did spend the walk back to the main road chuckling about how many other travellers must have followed the words of the guidebook expecting to find a shiny, sparkling w.c, maybe with hand driers, basins, mirrors, the works – only to find a shed and a hole in the ground! I walked along the path and headed to the easternmost side of the town, which looking at the map seemed to be a short walk. 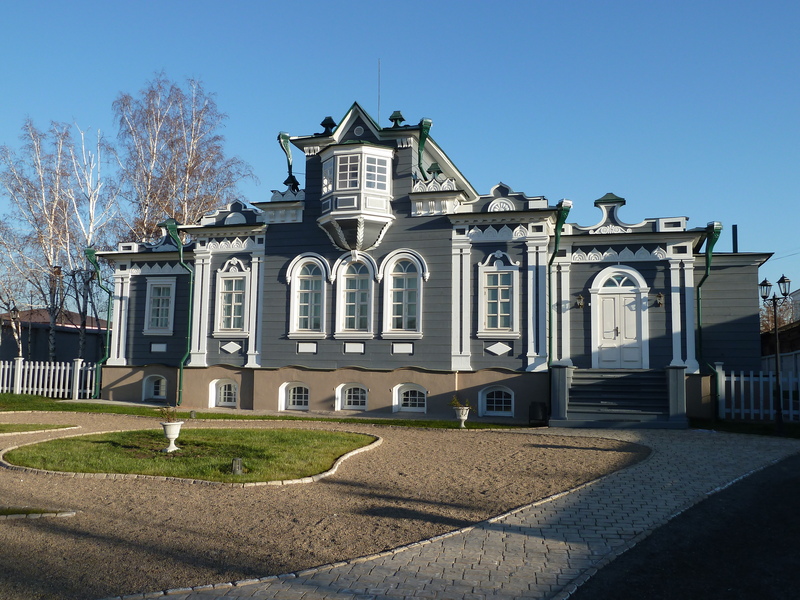 I failed to look at the scale, and three kilometres later, I eventually found the Baikal museum. It cost about £3 to enter, but I’m afraid to say it has to go some way to rival The Deep. 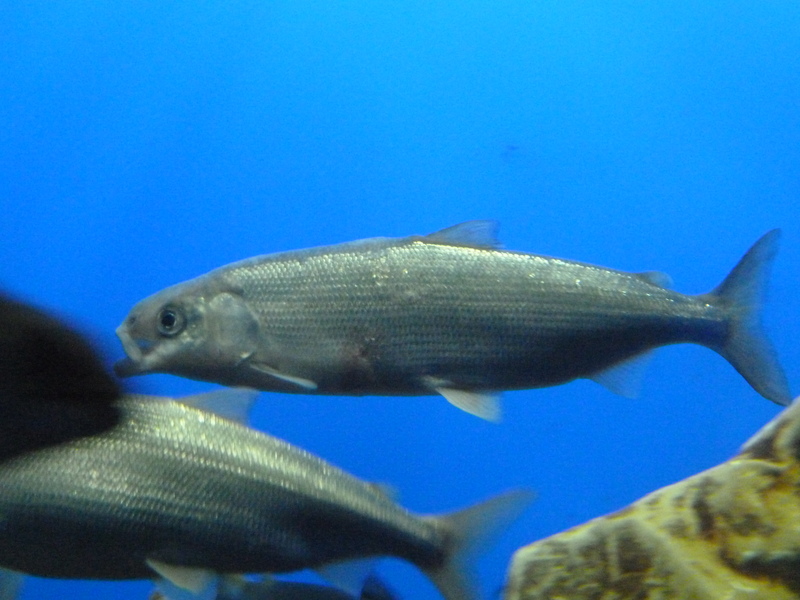 There were a couple of endangered freshwater seals swimming around in a tank that was clearly far too small for them, along with a few other exhibits of wildlife unique to the lake, including the Omul fish. People were selling these fish all over the place, normally barbecued and at the side of the road. Its supposed to be lovely, but my dislike of fish makes this delicacy off-limits! My map shows the hilltop lookout as being behind the museum, so I set off to try and find it. Yet again, Russia’s aversion to maps and helpfulness means I walk around in a big circle for a while, getting trapped on some form of wooden walkway, and then asking the person at the museum which way it was. Helpfully, she gave me instructions in German, although her pointing gave me the general idea of where to head. As I walked up a dusty track, and then climbed steps to another dusty track, I wondered if I was on yet another Russian wild goose chase. There was no ski-lift to be seen, just hills and trees. I walked up a hill, and was about to head through some gates, when there was a whistle from behind. One of the locals, wearing a traditionally big and fluffy Russian hat, motioned me to turn left – mainly as I was about to walk up to a military camp! The world's slowest ski lift! After what seemed like an eternity aimlessly walking up dusty tracks, looking for signs and wondering if a hilltop viewpoint actually existed, I began to see a metal building and heard a familiar noise – the low drone of a ski-lift winding its way up a hillside! It was a fairly hefty £4 to take the lift up, but after a good few hours hiking, I was ready for a rest, and I rest I certainly got. It was possibly the slowest ski-lift in existence! 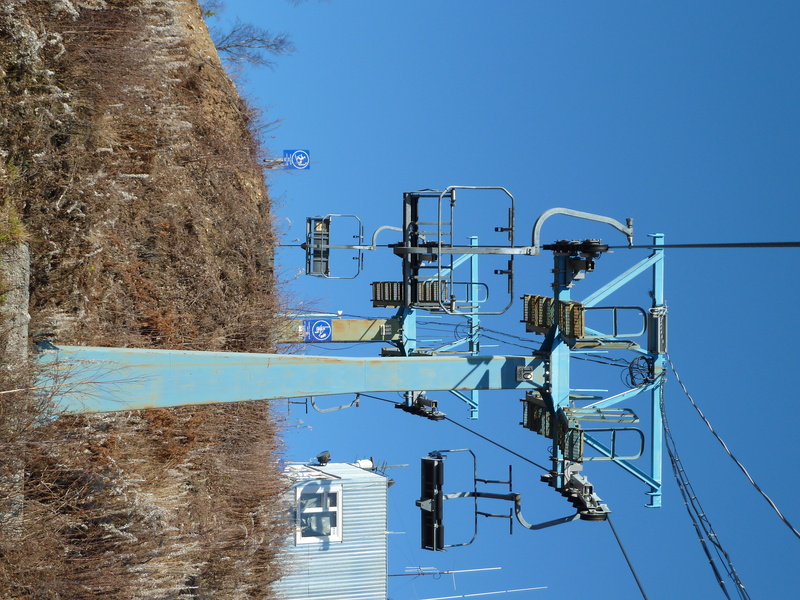 I’d have probably crawled up quicker if I’d tried, the chairlift slowly bumping over each wheel on the pylons at a boredom inducing pace, but it gave me a chance to analyse the slope below me, obviously a piste when it snows, and by the looks of it, a short but challenging run! Success -I found the top! The wait was worth it, the view at the top was spectacular. The sun was in completely the wrong place for photography from the peak, but I still managed to get some nice shots. 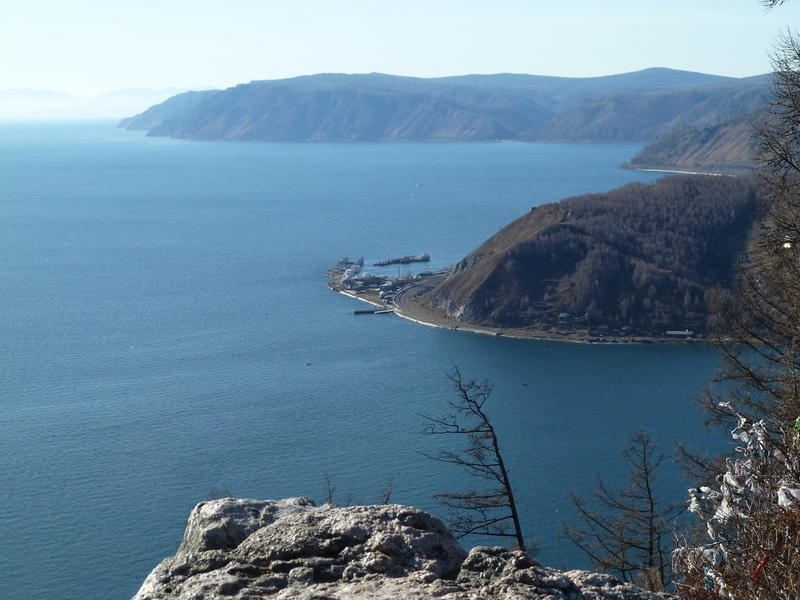 Below, the lake flowed into the River Angara, which itself flows all the way up to the Arctic Ocean. I met an American man from Charleston in the States, he’d asked me to take a photograph of him and his wife at the top, and he seemed as surprised as I was to find someone else who speaks English! They are few and far between around these parts, so we both enjoyed finding out about each others’ travels. He was there with his Russian wife –they had married in May and so had both now travelled to her home country to meet family. Also at the top was the Russian man in the furry hat, the local who’d whistled at me. He asked me to take a photograph of him on his phone, and then motioned to the sun and managed to gesture enough to me that it was a good day to visit the top of the hill. He seemed to enjoy telling me all about the lake in his native language, motioning how deep the lake was, how big it was, the fact Mongolia and China are on the other side. I decided to walk down the hillside, and comprehensively beat the chair lift down to the bottom, before walking the three kilometres back to the marketplace. While there, I bought a barbecued kebab. I asked if it was beef (‘rosbif’) but he just said it was 150 roubles and gave me it anyway. It came with a blob of ketchup and some onions, and it has to be said, was very, very nice. 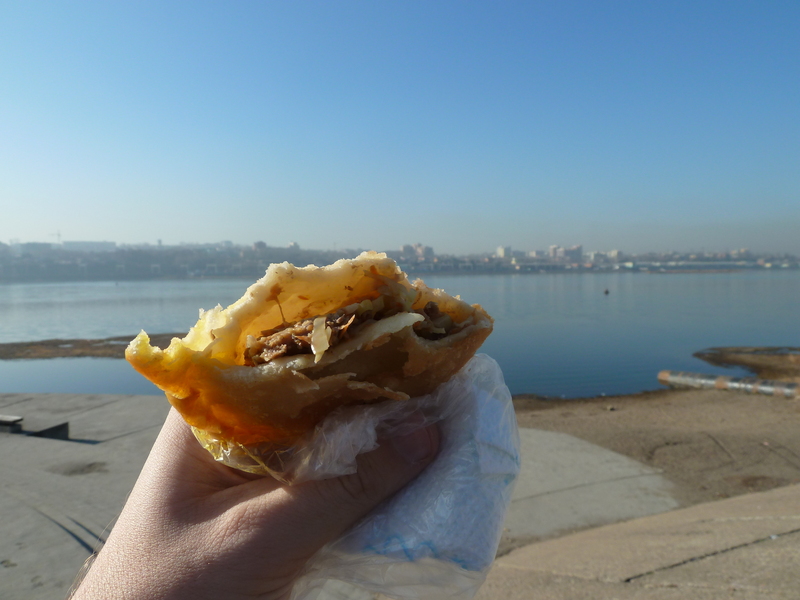 I sat on the beach eating the meat – be it beef, pork or yak – watching as the sun started to drop behind the mountains. There was a really nice atmosphere, people strolling along the prom, sitting on the beach, laughing and joking, despite the fact temperatures barely rose above freezing point all day. It was so cold, my camera battery died really quickly, so I wasn’t able to get any shots of sunset over the lake, but it was stunning. 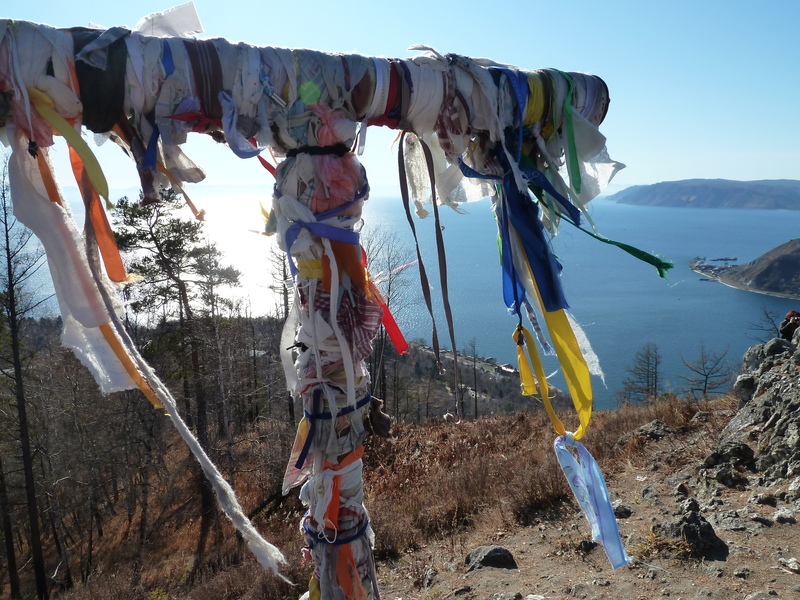 Legend has it that the Baikal waters are holy, and that if you dip your hands in, you will add an extra year to your life. Well, I’d done that just to wash the greasy mess off from the kebab – but if you dip your feet in, apparently you add another five years on to your life. So off came the shoes and socks, and I felt a bit stupid as I walked over the cobbles and went for a paddle. It was icy cold – the lake freezes over with three metres of ice for much of the winter – and it was almost unbearable. But being slightly superstitious, it was worth it for another five years! As for the legend that a swim in the lake adds an extra 25 years to your life – judging by the temperature around my feet, I don’t think I’d have seen the sun finish setting that day if I had gone for it. Some superstitions are worth forgetting about! 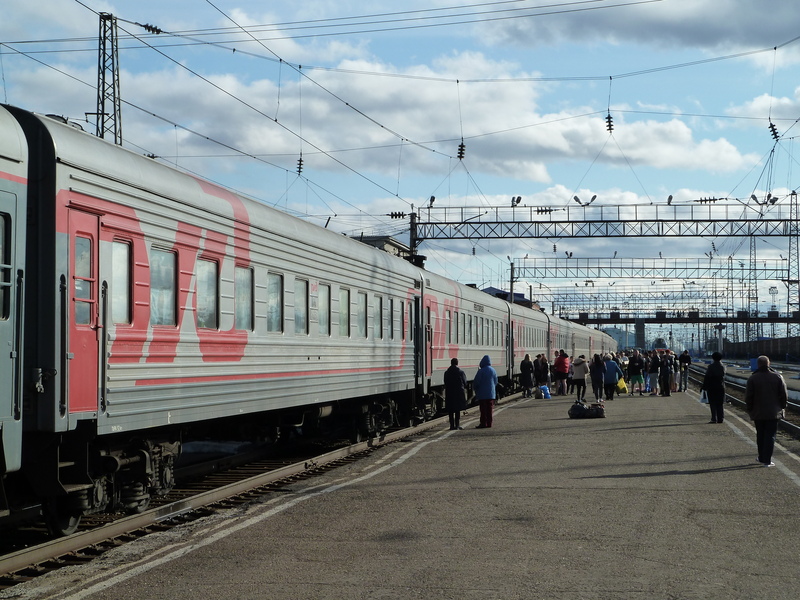 Day three onboard starts with the usual changearound – the two Warhammer fans get off at Novosibirsk, two other people move in. Its quite fun seeing who gets on, and we go through the same process of saying hello and that I cant speak English all over again! 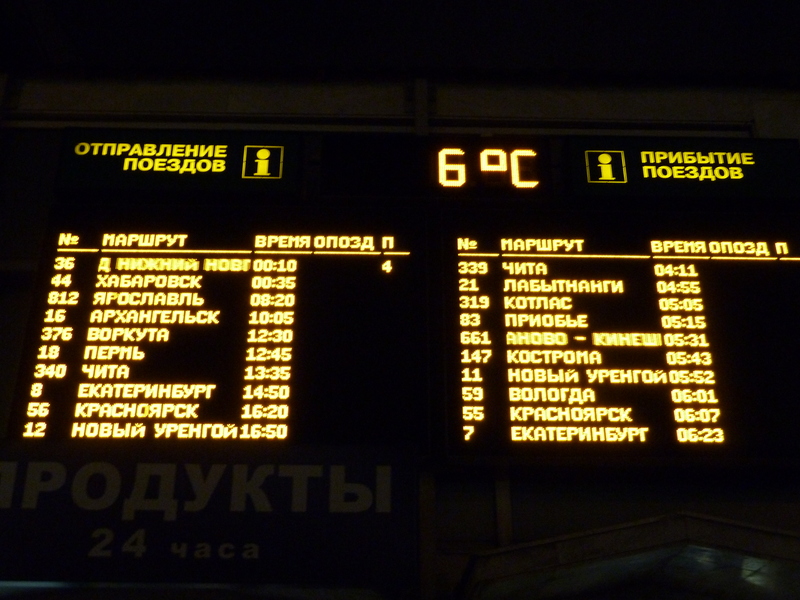 I got off at Novosibirsk and had a wander around to wake up a bit. My watch tells me its 9.30am, but all the station clocks say its 7.30am. 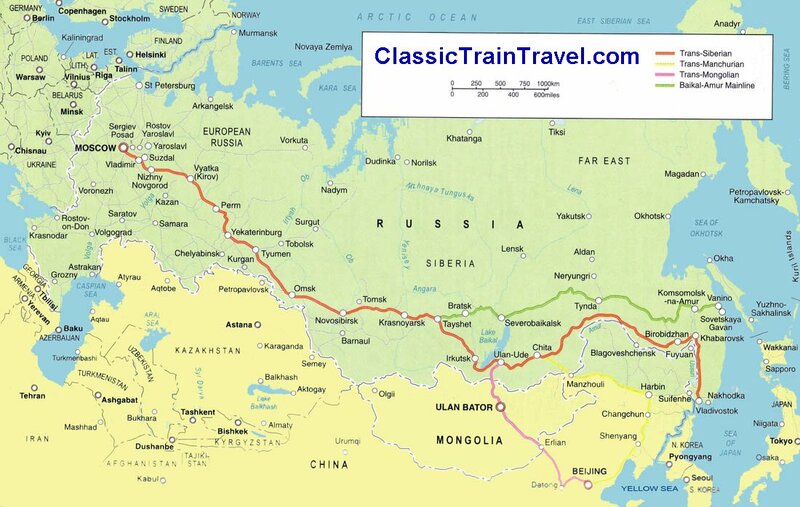 Ive adjusted my watch to the local time, as we’ve passed through two time zones, but it seems the railways here run by Moscow time to save confusion. I cant quite work out the logic for passengers – I don’t know how I’d cope knowing that I had to keep taking two hours off my given time just so I don’t miss the train. Novosibirsk had a big green station, and I took the opportunity to take a few photos and buy a stale chocolate croissant off the platform. Except it wasn’t chocolate, it was some form of date, and to be honest, utterly revolting. More Super Noodles for me today then! By now, the carriage attendant is becoming used to me asking how long we’ll be stopped for, and smiles as I walk up to her brandishing my watch for her to point at where the big hand will be when I either need to be back on the train or run after it. Amazingly, despite the thousands of miles these things go, they run on time – to the absolute second. Ive now worked out that there’s two carriage attendants, a man and a woman, and they sleep in the cabin two doors down. He usually works at night on station duty, she works during the day on station duty, hoovering the cabins duty, cleaning the toilets duty, stoking the samovar duty, polishing the glass duty, emptying the bins duty, even rolling out a bizarrely long, tea-towel style mat along the entire length of the carriage duty yesterday. Ive still not worked out what its for, im presuming its to protect the long thin carpet underneath, but every time I see it now its all twisted up, and she’s usually at the end of it trying to ‘right’ it like its some sort of skipping rope. In my cabin, my new travelling companions are working me out. Im presuming Yekaterina has told them about me in Russian, and they seem surprised that an Englishman is travelling across their country on his own. There was a moment of uneasy suspicion around the word ‘journalist’ that I could make out. Im trying to be careful about who knows, as I know the Russian authorities aren’t too keen on people in my profession. I then make out the words ‘James Bond’ in part of their conversation. Brilliant, what’s worse than being identified as a journalist in a former Communist state? Being fingered as a potential British spy, that’s what! I quickly said I’m no James Bond, and that I’m purely a tourist, and they laughed! Speaking of which, ive read in my Trans Siberian handbook that I’m supposed to have ‘registered’ my visa within three days of arriving in Russia. A very, very useful book! Naturally, ive not done that yet, mainly as I didn’t realise I had to. Ive either got to go to a police station, or get my hotel to do it for me. 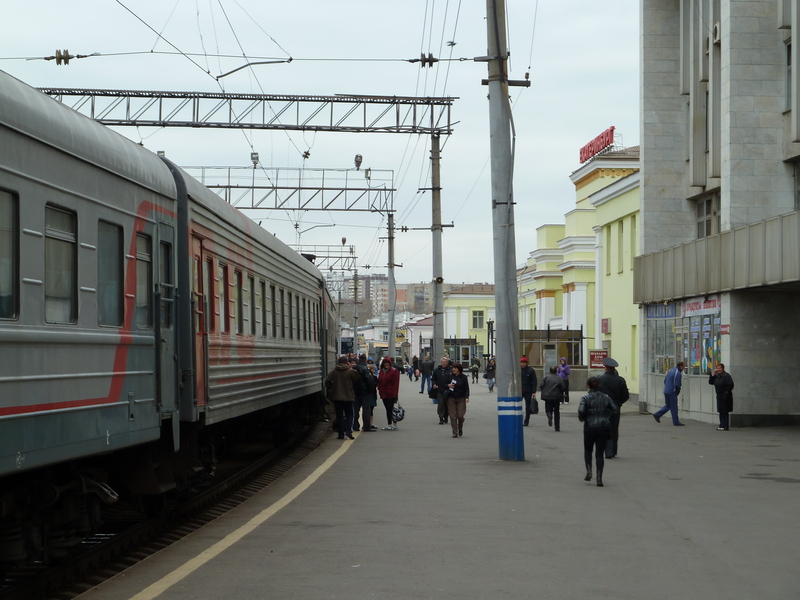 Seeing as ive been on a train for three days, ive not had much chance to do that, so hoping the authorities aren’t waiting for me in Irkutsk to deport me out of the country…or worse! I noticed a strange thing today. Some fairly main roads ran along the railway today, and I saw a surprising number of British lorry trailers being hauled around. There was even one from Howard, a haulage company I recognised from Grimsby. They tend to stick out a bit, as it’s the only thing for miles around written in English letters. There must be a dealer somewhere who specialises in getting old trailers exported to the depths of Siberia. Weird! I got a text from Dad earlier, who tells me their giant map from Amazon has arrived. They’re trying to work out how to mount it somewhere in the house, and they’re going to keep track of me around the world and plot where I am. Ive told them how ive passed through Yekaterinberg, and Dad said in the text how im a long way from home now – its starting to feel like it too. 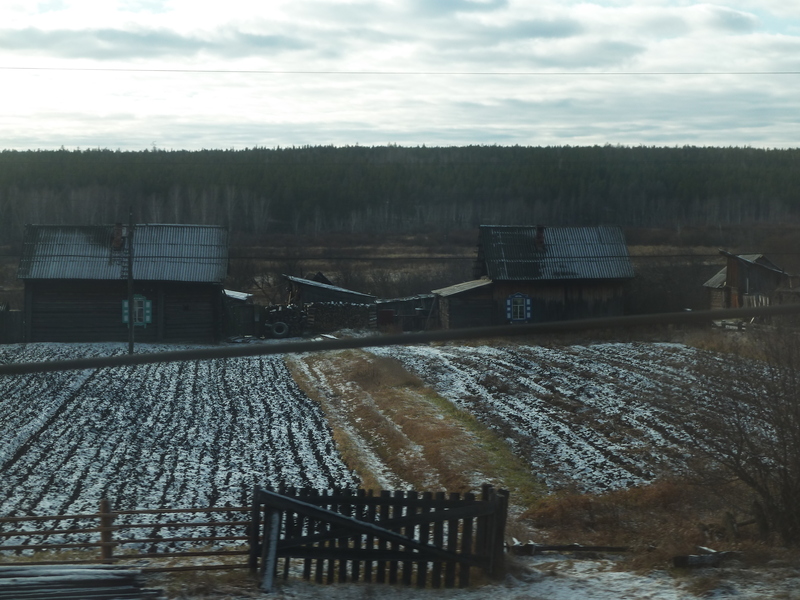 I’m right in the depths of Siberia now as I write this, just past the 4,000km mark from Moscow, and outside there is now snow on the ground. I wasn’t expecting to see any of the white stuff, but the plains we’re apparently passing through (its dark!) are frozen for much of the year. 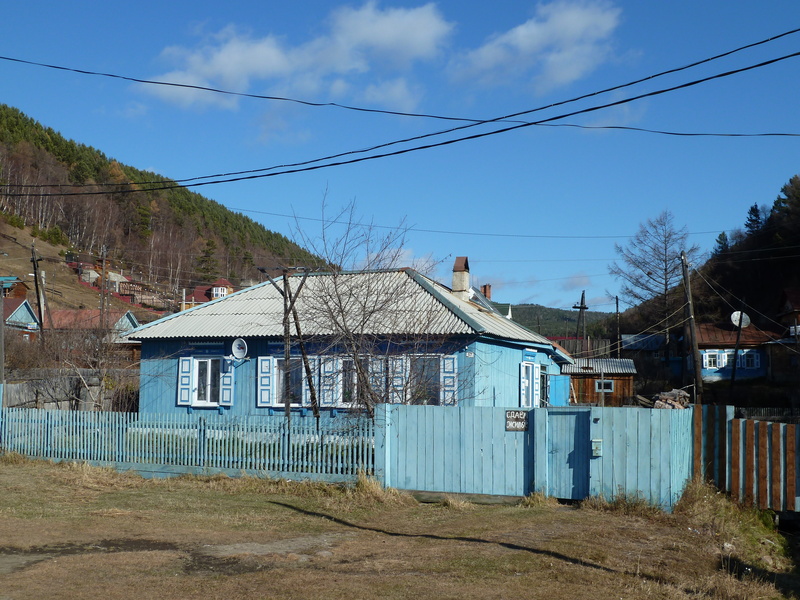 As I look on the map heading towards Krasnoyarsk, it dawns on me how utterly remote this is. Thousands of miles away from home, now days of travel away from proper civilization with things like airports and internet, and chugging along on the bit of the world you never look at on the atlas or at the back of a globe! Incredible. And I reflect on this with a half-litre bottle of Russian beer, my book….and curry-flavoured Super Noodles before heading to bed! Day four onboard, and I think Im starting to feel how contestants on Big Brother must feel, like it’s a bit of a social experiment. Or a prisoner, one of the two. Didn’t sleep too well last night as I was kept awake by the strange high-pitched snoring of my fellow top-bunk Russian traveller. Had we been mates, or known him better, I’d have definitely whacked him over the head with my pillow. I came close to it as it was, but he’s quite well built. Instead, I pulled the duvet over my head and tried to blot it out. I woke up at 9am local time, although I think im supposed to have added another couple of hours on overnight. The clocks at the station outside say 7am, but it definitely feels like mid-morning. Its strange not knowing for sure. The views outside are definitely better today – the grey, murky landscape has given way to a sunny, beautiful view. Its definitely colder, the lakes and ponds are frozen, and theres a dusting of snow on the little wooden houses we pass by. The train is now winding through some valleys, and you can see the front of it as it turns ahead through the window. It would make a great photo, but none of the windows open unfortunately. 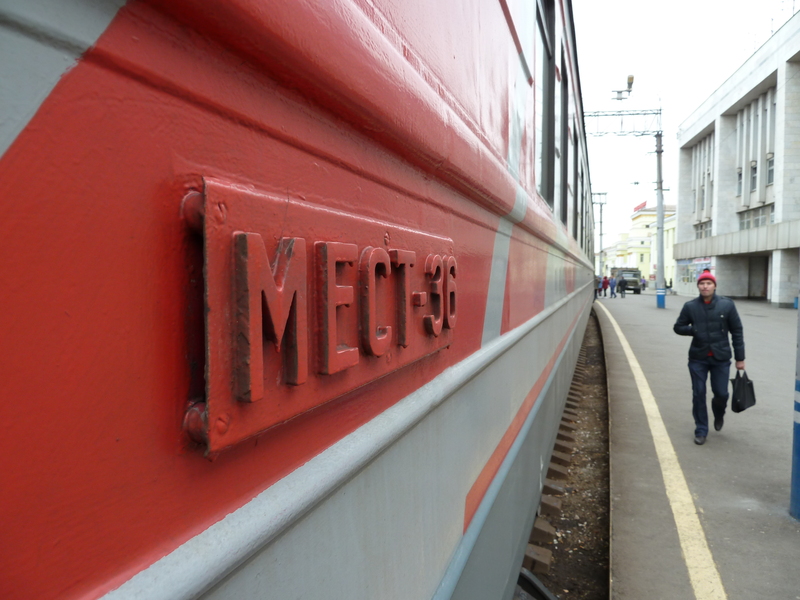 We’re due to arrive in Irkutsk at 2.40pm according to the timetable onboard, but ive now got no idea when that will be – im presuming Moscow time! I finished off my book this morning – from start to finish in two days, unheard of for me! It had 356 pages and everything, detailing Piers Morgan’s rise to fame on America’s Got Talent. There are some great tales in it. Outside the cabin, the carriage attendant has decided to roll up the giant tea-towel and is hovering away again. I stand by the window and look for a kilometre post, so I can work out where we are with the handbook – its got a km by km guide inside, so you know the key things to look out for. 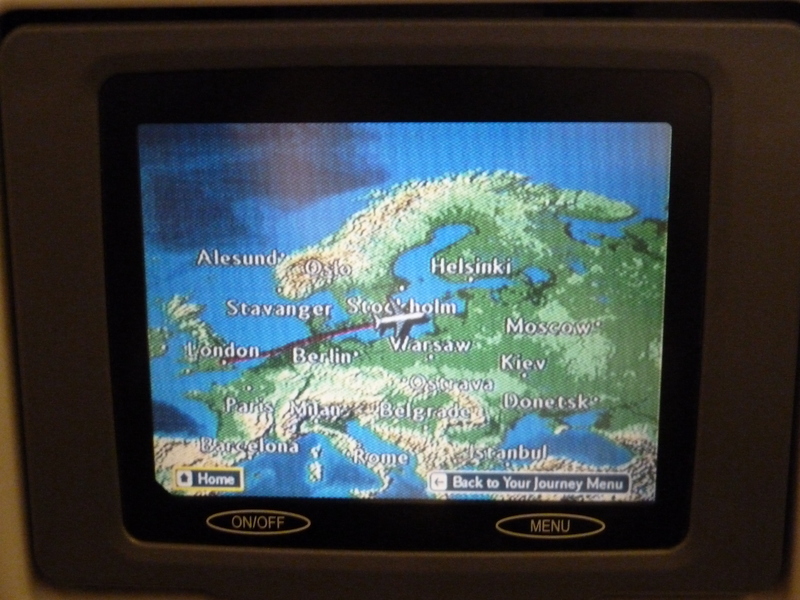 We’re at 4,998km from Moscow, so I stand and watch for the 5,000km post as it flashes by the window. That leaves just 185km until my destination. 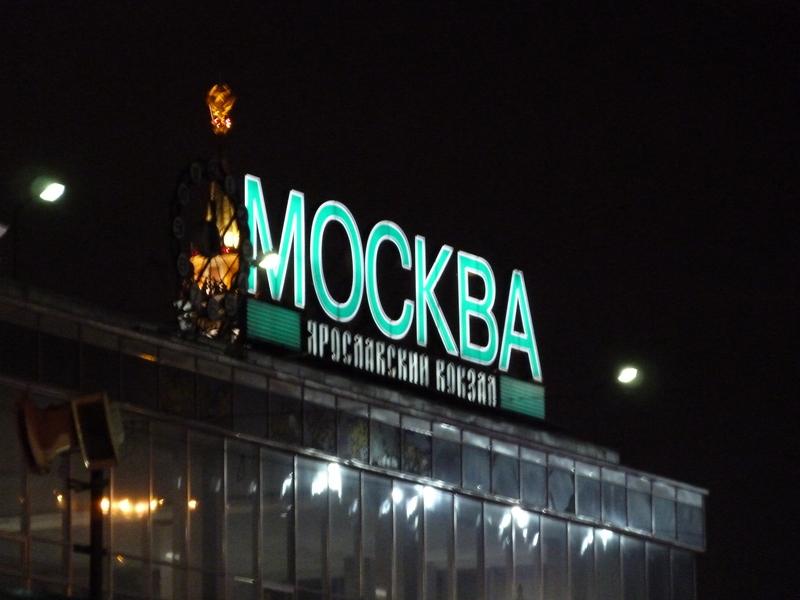 It seems a long time ago now since we were pulling out of Moscow, and while its been relaxing and enjoyable, it’ll be nice to get off the train and see somewhere again. Oh, and to eat something with a bit of substance. Speaking of which, its time for lunch…what will it be? Chicken or chow mein flavour?! He rang someone on the phone, who I worked out was picking him and his partner up at the station. He then starts nodding and motioning for me to go with him. Yekaterina said ‘he’s going to help you’ and it became clear he wanted to give me a lift. I couldn’t believe it, what a fantastic gesture – and without further ado, I was meeting his friend and being taken to their car. We went to the address given. Nothing. Yet again, the Russian way of ‘no signs, no directions, no hope if looking for accommodation’ was ringing true. Then I spotted a map and a sign – it had moved! By now, i’m feeling awkward – poor Yuri and his girlfriend/wife were probably itching to get home. Instead, they were insisting that they get me somewhere safely. I was humbled, such a kind gesture, and five minutes later, we found the Nerpa Backpackers hostel. I couldn’t thank them enough – an amazing gesture, and one that typifies just how kind-hearted and caring i’m finding this nation can be. 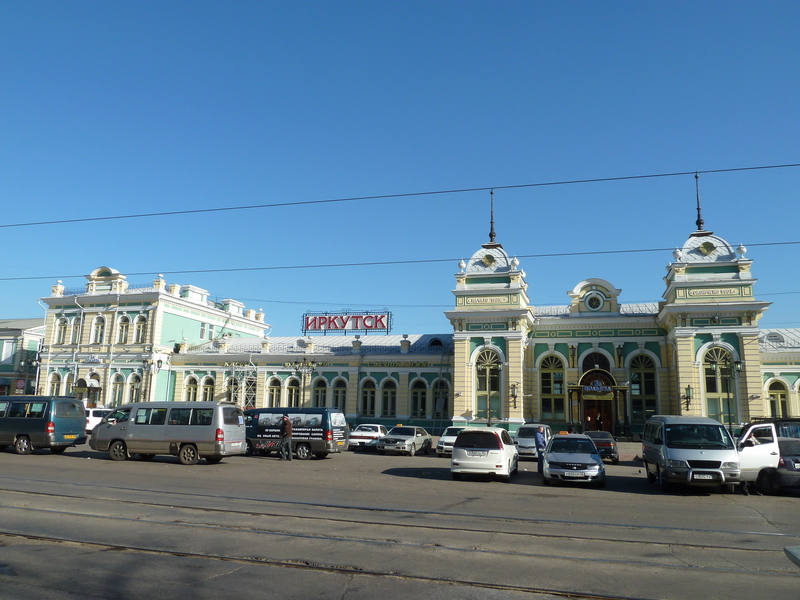 So here I am, Irkutsk, 5180km from Moscow, and now eight hours ahead of the UK time. Tried to get to sleep – suffering from that strange phenomenon known as ‘train lag’! After a quick stop to see the Kremlin and St Basil’s Cathedral lit up at night, I made it to the station with an hour to spare before my train. Totally unlike me, I know, but it was nice to be relaxed for once! Thankfully they still use numbers - Train 44 was mine! Although it was cold and dark, the station was full of people, laden down with suitcases, rucksacks, carrier bags and the odd animal here and there. 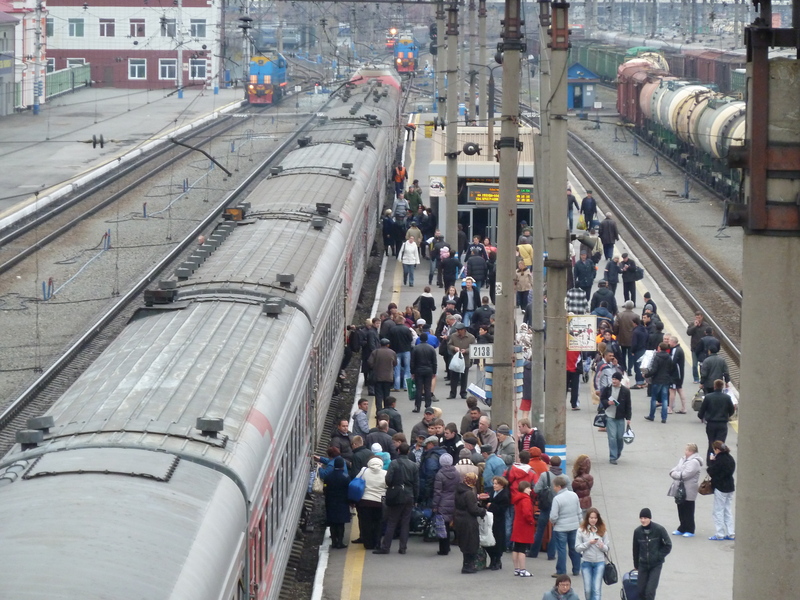 The train I’m booked on goes right across the entire width of Russia to Khabarovsk, some 8,500km, so naturally many people have supplies for the trip too. Some travellers seem to have brought an entire shop with them! 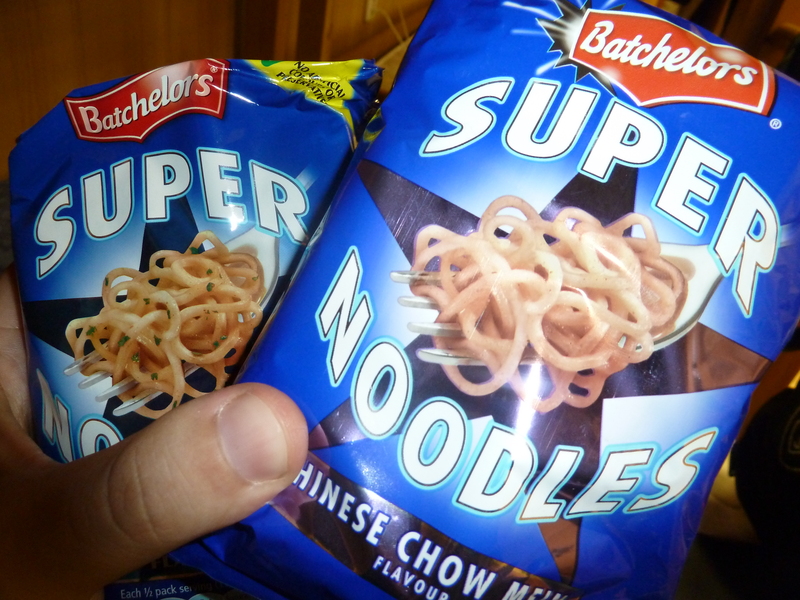 I’ve already come prepared – a trip to Tesco before I left the UK means my rucksack is full of Batchelors Super Noodles, some cheap Tesco home brand noodles (thought I’d give them a try!) pasta snack pots, crisps and biscuits to keep me going, as I’d been advised by my guide book. Im in carriage 10, and given berth 10 by the carriage attendant as I clambered onboard the train. 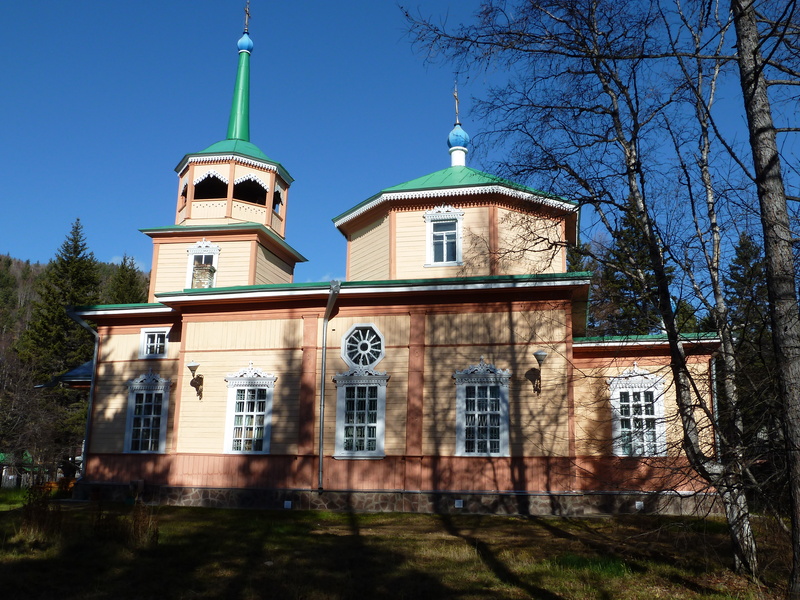 Its warm and cosy inside, with wood panelling, Russian-style carpets, curtains and a soft light. I’m in a top bunk in a room with four beds, which actually works out quite well because I can put all of my luggage in the compartment above the corridor. Soon after I get in, a Russian family arrive and start stowing their suitcases everywhere. In the corridor I see someone wearing a German football tracksuit top. I asked if he was German, thinking that he’s likely to speak a little bit of English if he is. Turns out his name is Igor, and he’s Russian – but his English is fantastic. Igor works in the cosmetics industry, and told me of his trips to Italy on business. 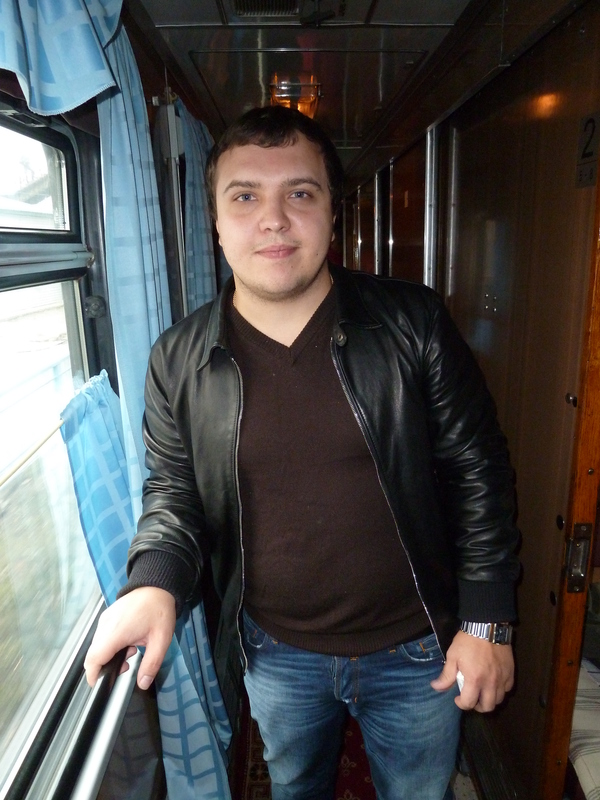 He seemed surprised I was on the train on my own, and even more surprised when I said I was heading to Irkutsk. He’s heading to Yeketeringburg to see his family, a couple of days away, but he gave me his business card and told me if I needed any help to go and see him. A nice guy. Back in my cabin, and the family are getting settled. At first, I didn’t think anyone could speak English – I worked out there was a mum, a teenage daughter and a younger girl who kept appearing from down the corridor, clutching a cuddly camel. At first, communication was through smiles and nods, but then we introduced ourselves. Nastya Kristell, the 15 year old daughter, knew a little English, and worked as translator. Then her dad Andrey appeared from down the corridor – their friends were in another cabin, and so were spending their time between the two. I spent many hours that night talking to both Nastya and her father – they had just returned from a family holiday in Hurghada in Egypt, and were now embarking on an 18 hour overnight journey to their home city of Kirov. Never again will I complain about a two hour drive back from Manchester Airport after a week in the sun! Andrey offered me a beer, and at first I politely refused, but then remembered from reading my handbook that it can be seen as rude to refuse. When he asked again, I accepted, and we laughed as we all tried to swap English and Russian phrases together. Nastya was practising her English, and secretly whispering Russian phrases to me as I tried to remember them, to our mutual amusement! 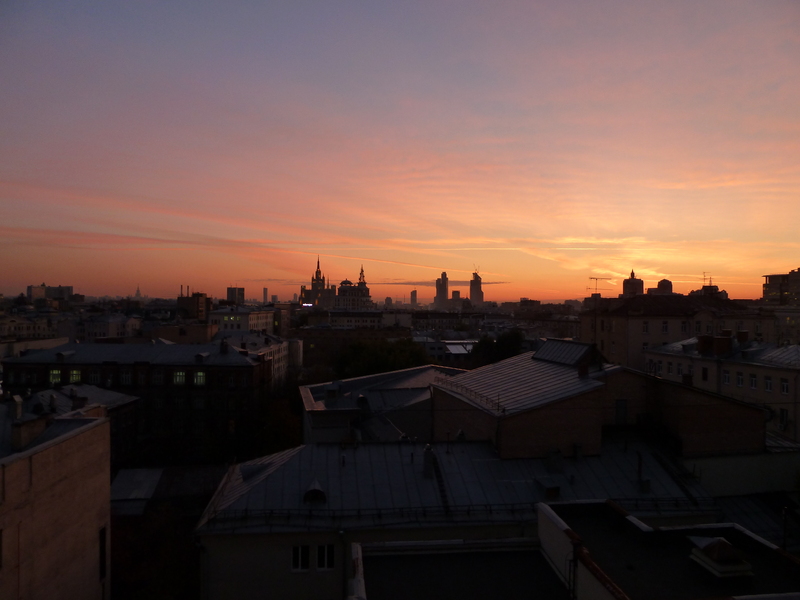 As the lights of Moscow outside changed into the darkness of the Russian wilderness, we all fell about laughing many times with our stories and bad translations, and after sharing some photos our lives back home, before we knew it, it was 2.30am and time for bed. Its quite perculiar trying to sleep on a train. First there’s the movement, and while I’m sure I’ll get used to it, it does move around a lot! Its more of a gentle wobble really, with the occasional jolt added just for fun. Then there’s the noise- the tracks aren’t especially smooth, so there’s the traditional clackety-clack, clackety clack that’s disappeared back home with better rails. The rest of the noise is passing trains – my head is right by the window, so anything going the other way is pretty noticeable, especially as it seems to be a Russian rail tradition to sound horns as the locos pass each train! I slept like a log in the end, so much so that I struggled to wake up the next morning. The motion of the train kept rocking me to sleep, and while I woke up at around 10am to have a look around, I made the fatal mistake of getting back into my bunk. Cue more soothing rocking and the repetitive clackety-clack, and I was dead to the world once again. I needed it though, the past few weeks had left me shattered, and to be honest its nice to be able to switch off and relax a little. My home for four days! Aside from the sleep, Im completely cut-off from the outside world now. As we head towards the 1,000km marker post, mobile phone signal is something of a rarity, while my new USB Data Modem stopped working as soon as we left Moscow. Without my music (iPhone issue again!) 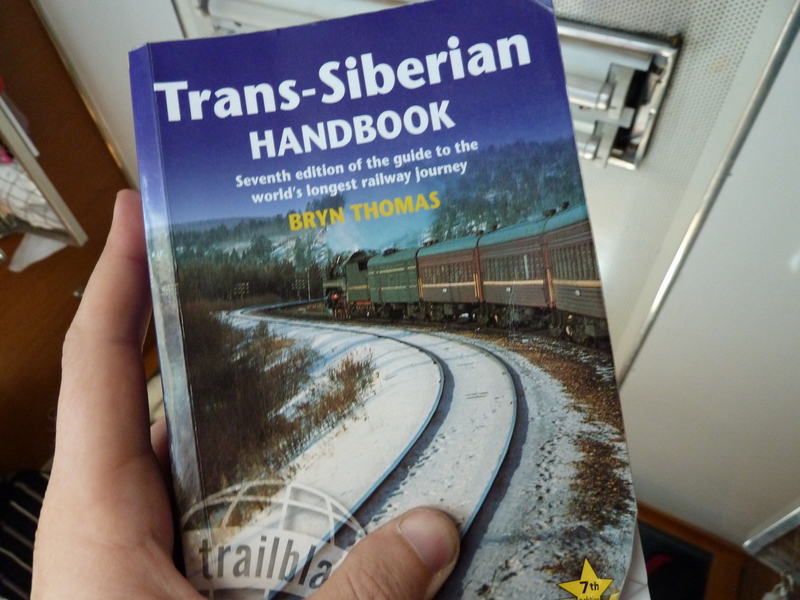 and having to preserve battery in my netbook, I read my Trans-Siberian Handbook for a while, planning the next few weeks, and decided to explore the train. Im finding it really comfortable, although Igor tells me it’s a very old train, and the newer replacements are much better. The only thing that is a bit grim is the bathroom – but even then, I’ve been in much worse. I’ve tried to get water out of the tap twice in there now though, and without success. It’s got two big cogs above it, which I presume are for hot and cold water, but try as I might, I can’t get any H20 out of the tap. It works, and I know it works as someone has splashed water everywhere, almost to tease me, but I give up for now. 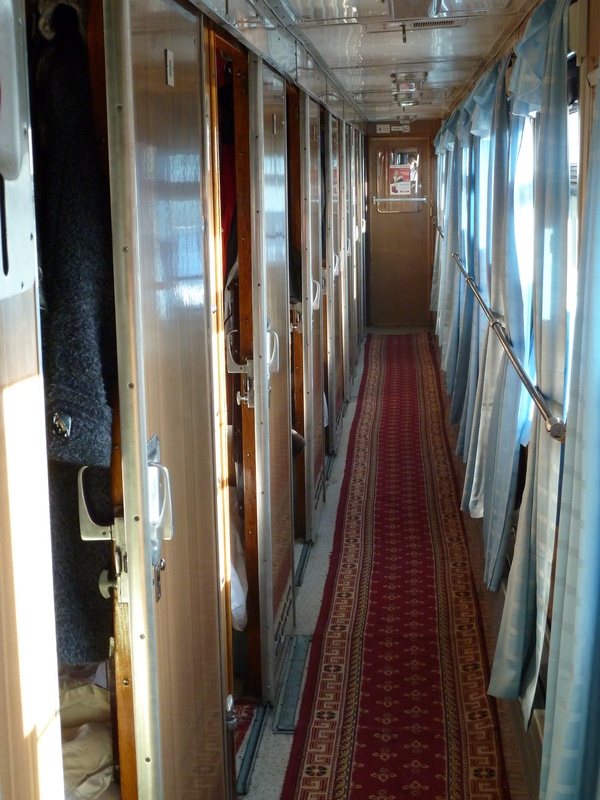 Each carriage in second class has about nine cabins in it, all aligned to one side with a corridor along the other side. 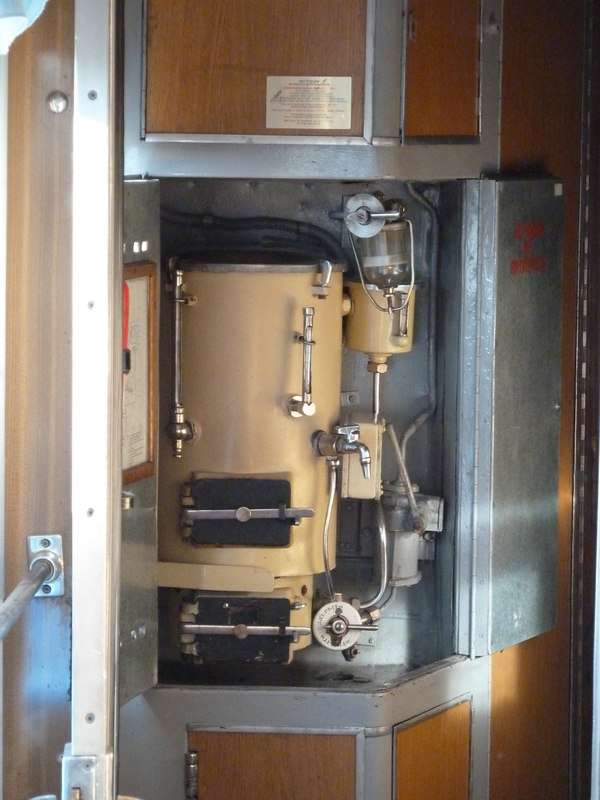 At the end of the carriage is a samovar, a coal-fired water boiler which has an endless supply of water, and is also responsible for the intense heat which seems to build inside the train! Every now and then, somebody walks past with a bowl of steaming noodles or soup, and from somewhere there’s a supply of tea in a glass cup with a handle. I’ll look for those later! I decided to head down the train, and over the slightly daunting joins between the carriages where the tracks are whizzing by in the big gaps below you at 40-50mph. The restaurant car is only two carriages away, but it seems quite pricey and from what I saw, the food didn’t look that good. I decide to stick with the Super Noodles from the samovar for now, and pick up some supplies from the station traders as we stop along the way. I searched through my book for answers about how to get water out of the taps in the bathroom – and there it was. Apparently, you have to use a little lever right underneath it. I ventured to the bathroom to give it a go, and out the water came! I was quite relieved – I was in need of a wash by now, so freshened up. 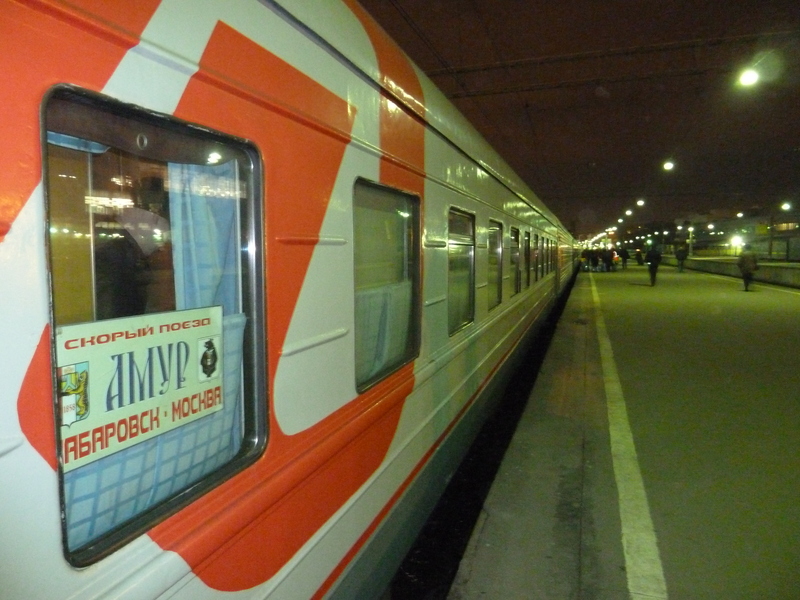 Then I went to the carriage attendant and asked for some tea – its 10 Roubles for a teabag and glass, so about 20p. More importantly, it came with a spoon, so I can now stop slurping my noodles straight out of the Tesco Snack Pot container I’ve fashioned into a reusable bowl!! Back in my bunk, Andrey and his family are preparing to get off. He told me how he wants to go to Thailand next year, and I showed him some of my photos from my visit earlier this year. He’s got a battle on at the moment, as his daughter wants to go on holiday on her own. He asked me what age children in England are allowed to go on holiday on their own, and disappointingly for Nastya, I told him around 18. She rolled her eyes and laughed- she was pinning her hopes on me taking her side… I told her you’re never too old for a holiday with your parents! Andrey gave me some Egyptian jam and a teabag as a gift from his family, and took some photographs of me with them. I took some of them too, and I knew Nastya was impressed when I told her that I worked for the BBC, and knowing I had a BBC Open Centre pen in my bag, I gave it to her as a present. Just the BBC logo on it meant something to her as she ran her fingers along it – I think the BBC is still so well-known and respected here. She gave me a hug, as did her father, and we said our goodbyes. I watched through the window as they ran out to meet their family who had met them at the station. They turned around and waved at me. I was sad to see them go if im honest – they had made my first daunting night onboard such an enjoyable experience. I realised we were stopping at their station for a while, and as they were still on the platform, I went out to get one last photograph of them all together as a family. The camera was quickly taken from me, and I was ushered into the middle for a few photos with me too. It was lovely to meet them, and I wished them every success in the future before they headed to their cars and their nearby flat. 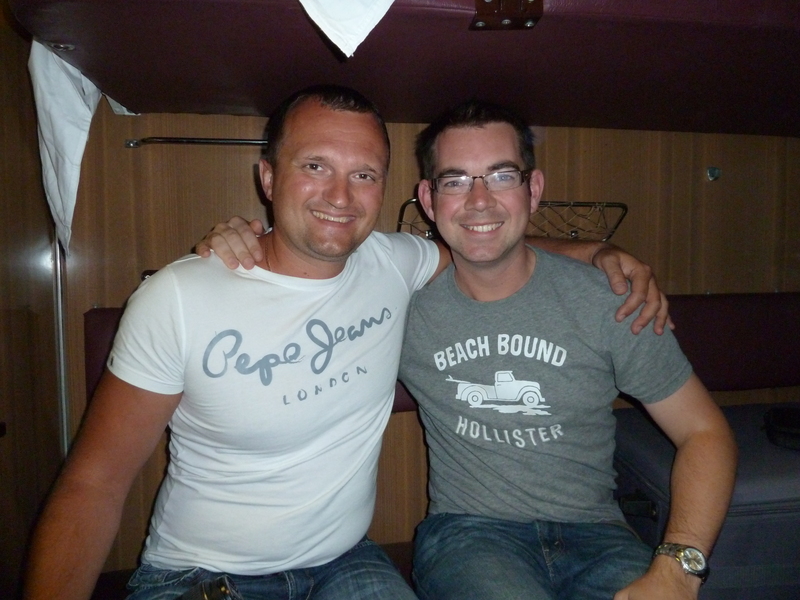 If everyone I meet on this journey are as friendly and fun as Andrey and his family, this will be a fun trip! I bought some Coke from the station shop and got back onboard. Two older Russian men were now in my cabin, and although they mustered a ‘hello’ didn’t really say much else. Thankfully I bumped into Igor who was heading for a cigarette, and we spent the night chatting. We got off at one station and walked the entire length of the train, getting some much needed fresh air, and watched as the locomotive was swapped over at the front for the next leg of the journey. It’s a cold night, our breath drifting into the stillness. Police dogs and guards are patrolling the tracks, checking the trains, while a maintenance man does what the maintenance man does at every station I’ve seen so far- walks along whacking every axle with a long-handled hammer and listening to the noise it makes. It sounds strangely like a xylophone. 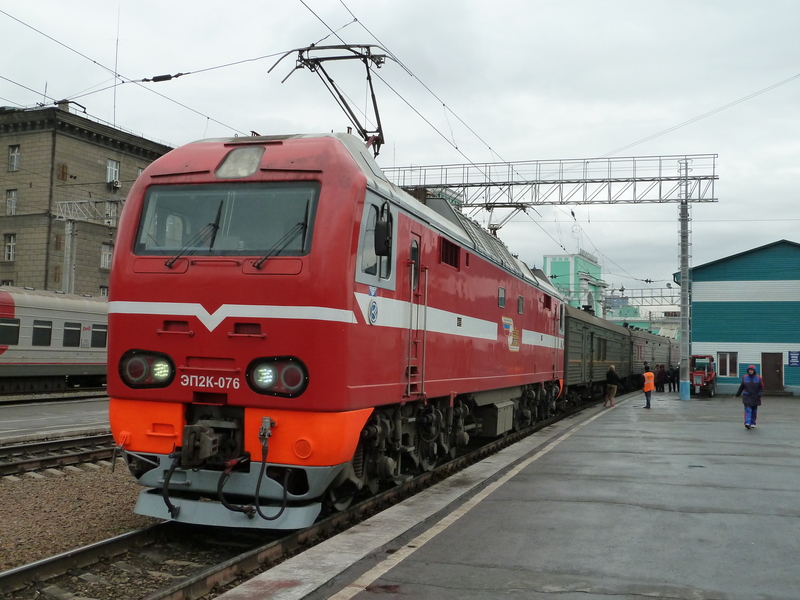 Back on the move – with all axles intact – and after another hour of talking in the corridor, Igor and I are politely told to shut up by another passenger, so we went to bed! 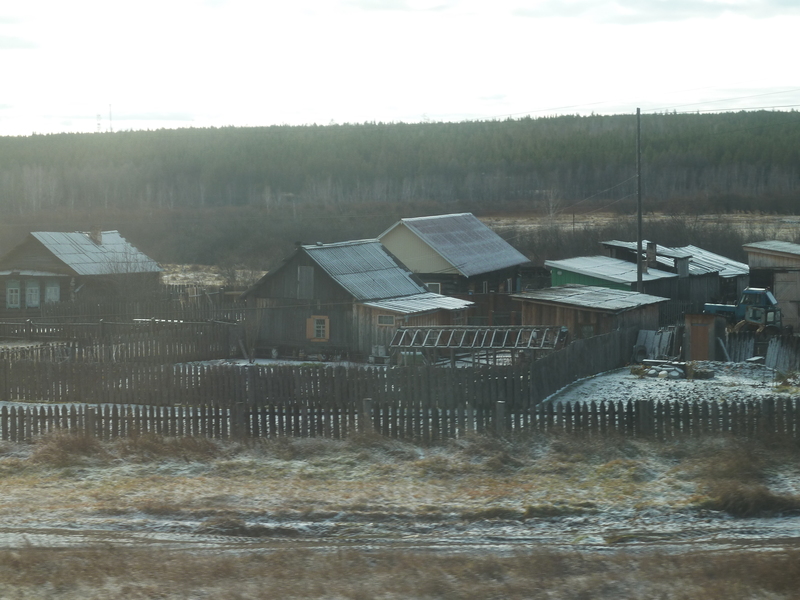 The next morning I wake up as we approach Yekateringburg, some 1,816km from Moscow. It’s where Igor is getting off to meet his family, but he gives me a guide as we drift into the town, pointing out the main factories and a huge towerblock that was built on unstable ground without planning permission. Even Igor says it was a crazy thing to do! 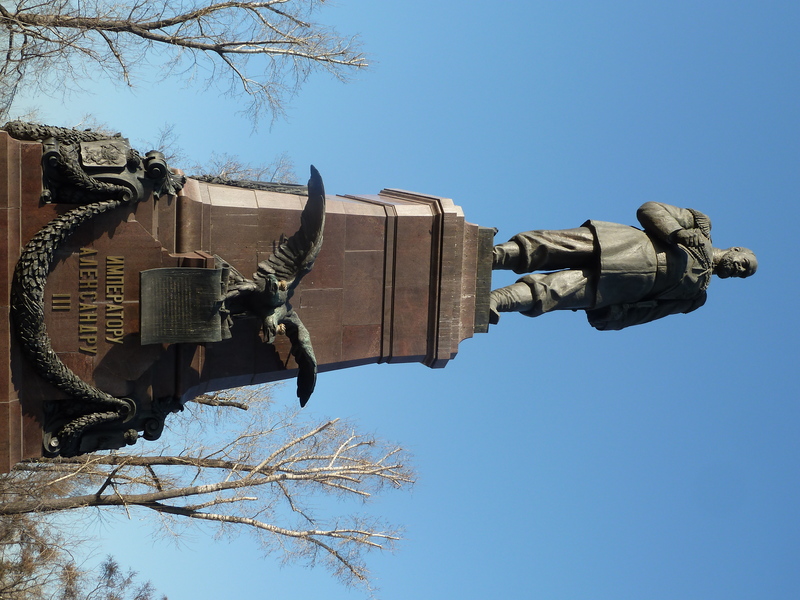 As we arrive in Yekateringburg, I walk to see Igor off the train. His mum and dad are there waiting, and he introduces me to them in Russian. The only bit I understand is the word BBC, to which there are raised eyebrows, gasps and then hugs all round! I think his parents must have been parked on double yellows or something, as they needed to be off in a hurry, and Igor gave me a manly hug and a pat on the back, and wished me well for my trip before walking down the platform with his suitcase and parents in tow. There’s an old lady in my cabin now. She got on in the middle of the night in Perm. She wears really thick glasses and fairly bright lipstick for a grandmother. At first im not sure how to take her – she looks a bit serious, and clearly cant speak much English. I think she’s a little unsure of me too. For anyone reading this who went to Healing School, she reminds me of Mrs Storey, same height, build, even looks very similar. 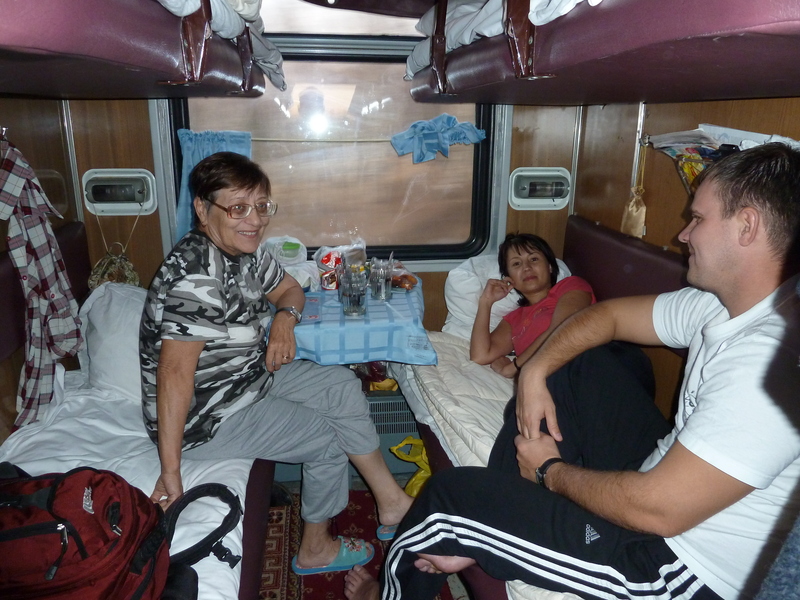 She motions me to sit down near her on the lower bunk, pats my knee and says something in Russian. I do my usual ‘Sorry, im English, I don’t know Russian’ act with a big smile and a wave of my hand near my throat (I don’t know why that seems to indicate we cant speak the language!) In broken English, she asks my name, and the ice is broken. Her name is Yekaterina, and she’s on her way to visit family at the last stop for this train, Khabarovsk, not far from the Sea of Japan. A lot of our conversation is done through pointing, smiling, motioning and looking at photos on her camera and on my laptop. I work out she’s got a son, and her grand-daughter is a student. That’s when the food offering starts again, and she pulls out what look like some uncooked Findus Crispy Pancakes. She tells me I must eat three of them, as it’s a Russian tradition, and thrusts one into my hand. 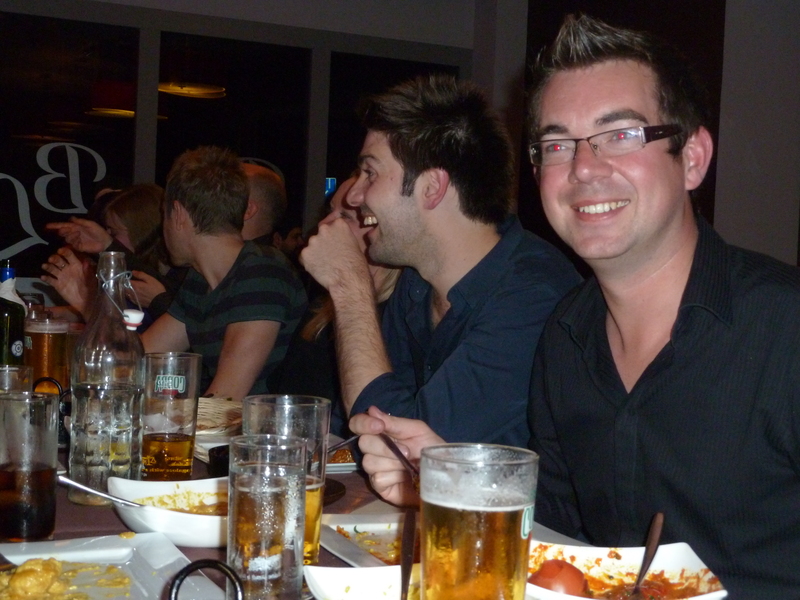 I’m not entirely sure what was in it, I think it was minced chicken or something, but it tasted quite nice. It’s a good job, as I wasn’t going to be let off with just one, and two more later, I’m quite full. I offer to get her a cup of tea to return the favour, but she asks me to fill her cup with hot water instead. She’s got her own supply of teabags, and looks at me as if I’m daft for buying one from the carriage attendant! Outside, the scenery is changing. Until now, much of the view has been of trees and forests, but as we’ve headed west, its visibly turned from Autumn into Winter. 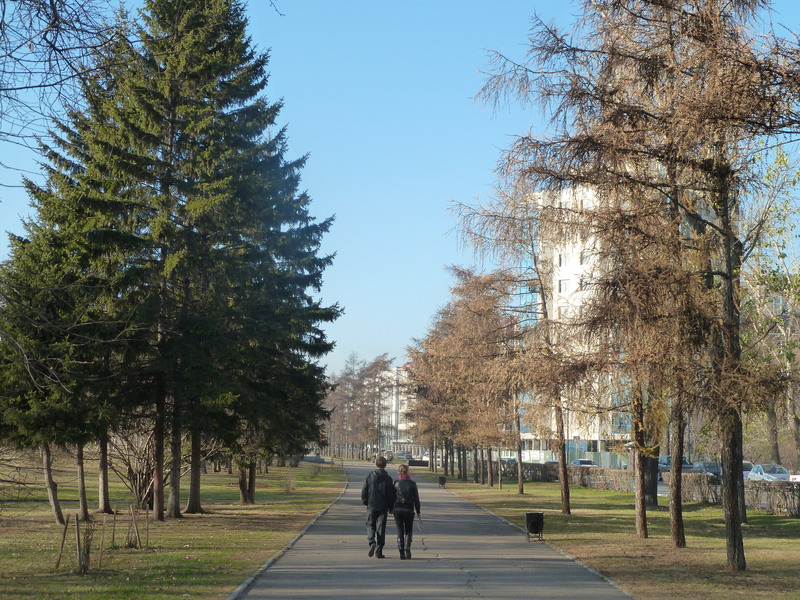 In Moscow, trees were still hanging onto leaves, rather like back at home. Gradually, the leaves have disappeared, and are now all on the ground. 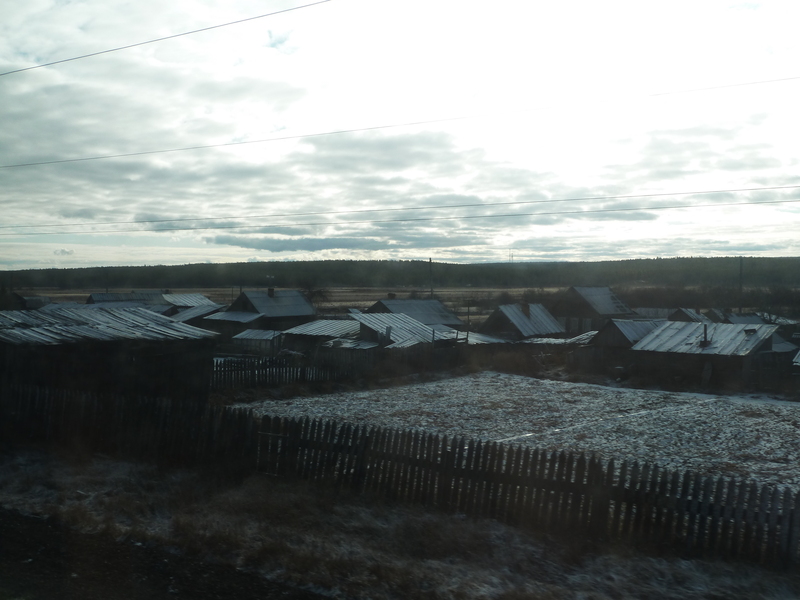 Igor had told me its unusual not to have snow by now – maybe I’ll see some before we arrive in Irkutsk. The trees are also thinning out, with lots of empty grasslands and meadows, interspersed with a few huts and houses here and there. 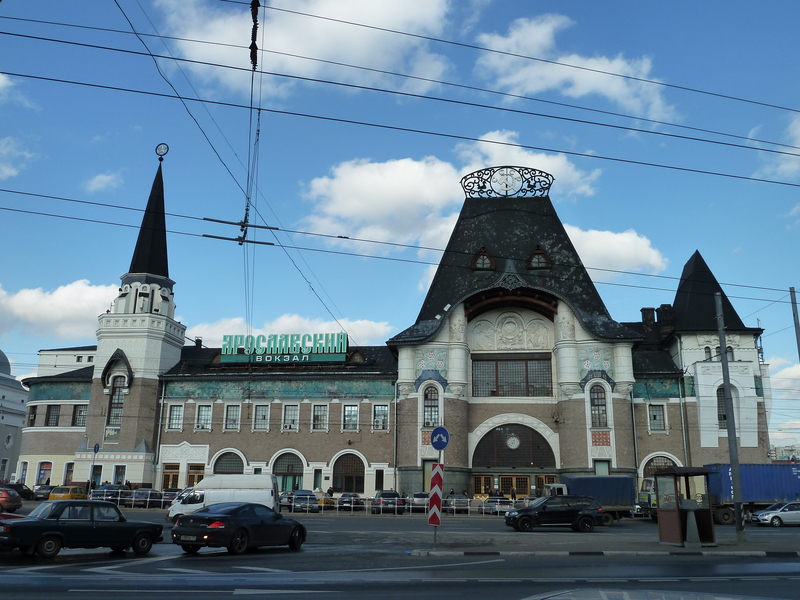 Every now and then, we’ll stop at a station, the longest today being at Tyumen. A young couple get on, meaning for the first time on the trip the cabin is full. Yekaterina talks to the guy, and shows me his bracelet/necklace thing he’s playing with. Its something to do with the game Warhammer apparently. Ive never played the game, and I probably shouldn’t say this, but associate it with geeks – and despite him not knowing much English, he strikes me as the sort of person that would play Warhammer! I think there’s been some Warhammer convention on somewhere, and he’s heading home to Novosibirsk, where we’re due to arrive tomorrow. Nice enough couple though. Life onboard is getting to be a bit of a routine now. The trick is not to think of it as a journey to somewhere, and to count off the hours until you get there, but to enjoy it as an experience. It was certainly fun trying to have some form of decent wash in the toilet earlier – and I mean in the cubicle, not in the actual pan, before anyone says anything! Space is limited, so I managed to hang my clean clothes up on the peg, filled the bowl with water thanks to my squash ball plug (a great travel tip by the way – they block up sinks and you can play with them!) and basically gave myself what can only be described as a standing-up bed bath! It was awkward, water was sloshing around everywhere, but I didn’t care as before long there would have been complaints from fellow travellers…or I’d have to start handing out nose pegs! It felt much better to freshen up and have clean clothes on, and I returned back to my cabin and an admiring glance and squeeze of my shoulder from Yeketerina! Im fascinated by how many people are using the train, and indeed how many trains there are travelling backwards and forwards across this vast country. Back home, I had visions of an empty railway line with one or two trains a day trundling along, each with a few tourists doing the same as me, knowing they can add ‘worlds longest railway journey’ to their list of things to do before they die. Another station and more passengers! These are actually really busy railway lines – at least one train passes us every 10 minutes or so, be it a passenger or freight train, and most of the compartments onboard are full of people travelling around this huge country. Speaking to a few of them, they reason that the train is safer that flying. Russia has a dubious flying safety record at best, so its understandable. Its certainly more relaxing – I’ve got my nose into Piers Morgan’s ‘Don’t You Know Who I Am’, his follow up to ‘The Insider’, and the first time I’ve properly read a book for years. I sometimes get ridiculed for this, being a journalist and not reading much doesn’t seem to compute with some people, but the fact is I hardly have the time! On here, I do, in between dozing off for a few minutes after being rocked to sleep. Its just what I needed, and something I certainly wouldn’t have considered on a normal annual leave holiday- I’d have seen it as being stuck on a train for a week and wasting my time off, rather than treating it as a once in a lifetime experience, as I am able to now. Once in a lifetime or not, im certainly getting fed up of Super Noodles. I went for the chicken flavoured packet tonight. I’d hoped that the station vendors would be selling sandwiches, or something useful to eat. Instead there seems to be lots of packets of fish strips, manky chicken and big Russian Pot Noodles, none of which particularly float my boat at the moment! I take myself down to the restaurant car in the end, not to eat, but to sit and watch the world go by with a beer and my book. Today seems to have flown by, and already we’re almost halfway to Mongolia. I landed in Moscow with a bump…to the head. From a very large, very heavy leather laptop bag that slid out of a luggage compartment and straight onto me. The seatbelt signs hadn’t even been switched off, but one bloke decided he needed his stuff earlier than everyone else, therefore catching me unaware. Glasses flew off, the lot. The guy next to me actually had a go at the bloke who opened the compartment, but to be fair to him, he was beside himself about the whole situation and couldn’t apologise enough. It was about an hour’s wait, semi-concussed, to get through passport control. I’d been expecting it because of how difficult it is to get a Russian visa. There was no point making people jump through hoops, getting invites from people or companies in the country, listing exactly where and when you’ve been abroad for the last 10 years, even going in depth about what I do and have done for a living, if they weren’t going to be thorough at the border. Before long, my passport had been stamped, and I was officially in the country and on my own. 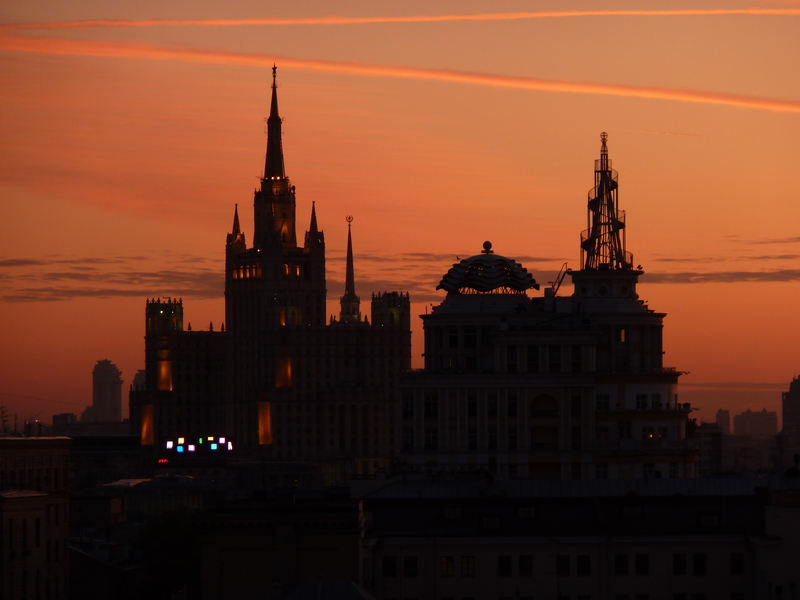 I knew the British voices I could hear around me would start to disappear, and by the time I reached the AeroExpress train to the centre of Moscow, I was the only foreigner around. I ate a slice of leftover Dominos pizza I had foil-wrapped in my bag, and took in the pleasant aroma in the carriage. It was like an air freshener had been placed somewhere nearby. At this point, I had no idea where I was going. 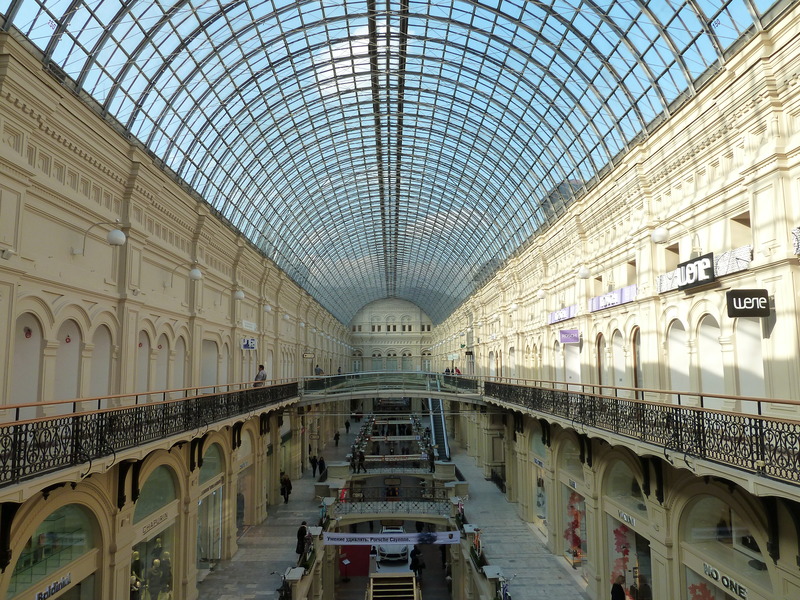 I’d booked into a hostel that I had put down on my visa application for the authorities, but I had no idea where in Moscow it was- I’d planned on getting all that on my phone. 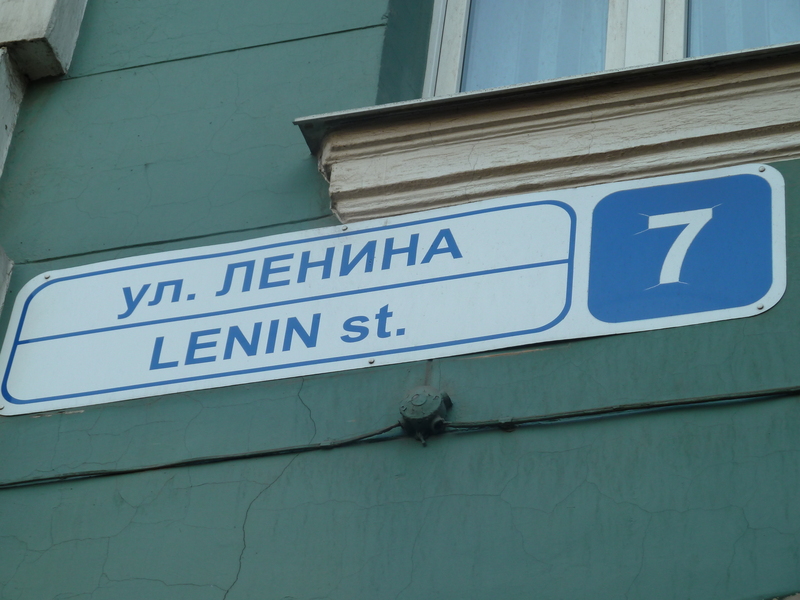 I remembered reading it was within walking distance of Red Square and the Kremlin, so I looked to see where the nearest Metro station would be on the basis that someone would recognise the name of it. That’s when it started to dawn on me just how difficult it is to navigate around the city. Absolutely everything is in Cyrillic, with no English translations or letters anywhere. I didn’t really know where the station was that I’d just arrived at, but by analysing a few maps in my guidebooks, I worked out I was to the south east of the city centre. With my rucksack weighing me down, I found my way to the Metro station, and as often is the case I’m finding here, joined a long queue for a ticket. I got their form of a travelcard with five trips on it, and made my way down to the platform. Well, to say the stations are elegant would be an understatement. Never have I seen such amazing architecture in a railway station. The ceilings and walls were more like what you would see in a historic museum, ornate plaster sculptures and pictures, fantastic chandeliers and marble from the floor to the roof. The only thing that lets it down is the slightly dilapidated looking trains which run through them….oh, and the fact its nigh-on impossible to work out where you need to be going! So much thought has obviously gone into how to decorate the stations, that it doesn’t seem to have occurred to someone that people might need maps on the platforms. 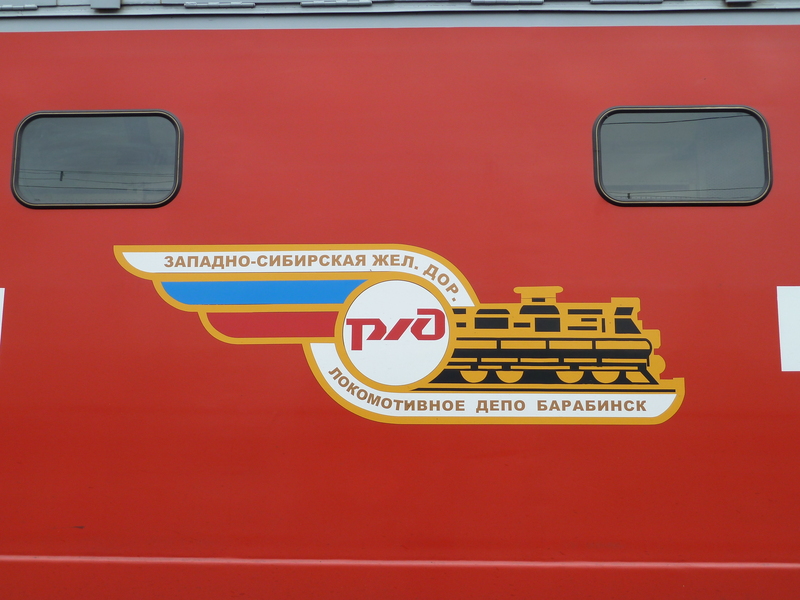 The Cyrillic words don’t seem to match the Cyrillic words in my guidebook, and with no helpful pictures or arrows anywhere telling which train heads where, it was a bit of pot luck. I got on a train (which incidentally, are full of maps) and matched the next station name with the one in my guide. I was heading in the right direction! I emerged into the cold dark night, onto a fairly quiet street, at around 11pm. Most of the shops were closed, and there were very few people around. I walked for about 15 minutes, aimlessly I guess, wondering where the hostel was. 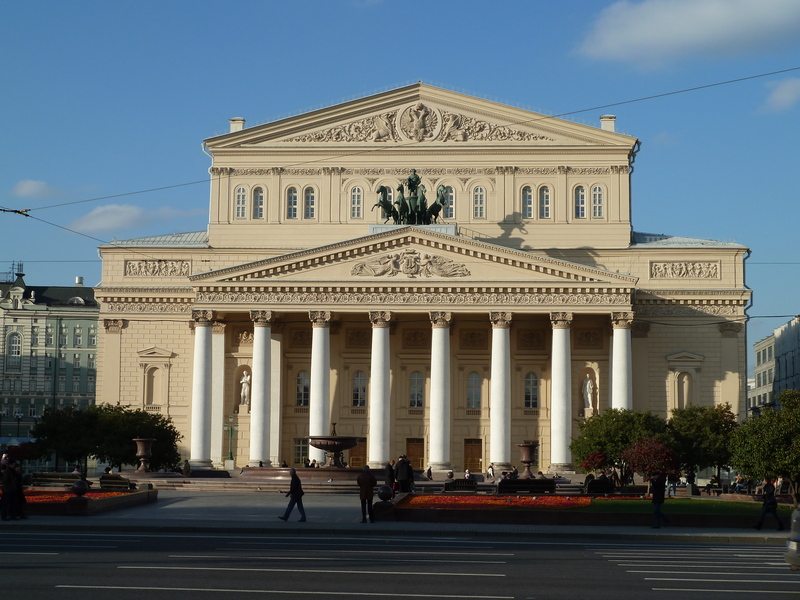 I knew I was near the main sights, and next to the Bolshoi Theatre a taxi driver pulled up. I asked if he knew the hostel, but even I knew that without the street address, he had no chance. Besides, he needed a magnifying glass to try and read my English, and with a shrug of his shoulders, he drove off. I needed help, and my only lifeline without my smartphone was yet again my netbook – and a backstreet Dunkin Donuts with a big ‘Free Wifi’ sign on the door. I bought a coffee and browsed the web, finding all the details I needed. Or so I thought. I waved the screen under the nose of a taxi driver, who made a grunt and motioned me to put my things in the car. 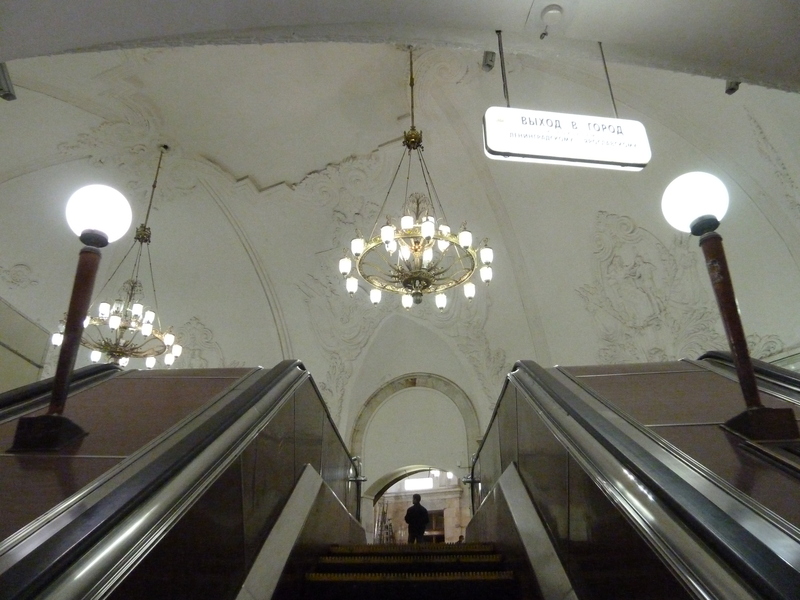 There was a familiar smell inside – exactly the same smell as the airport train. Perhaps its some ‘Moscow public transport’ aroma, which would be a nice, unexpected touch. I sensed the hostel wasn’t too far away, and as we whizzed through the streets and the bright lights of Moscow (speed limits don’t seem to exist here) we quickly got to the address on Tverskaya Street. There was nothing. No signs, no brightly-lit doorway I was expecting – just an abandoned old shop on the otherwise thriving street. 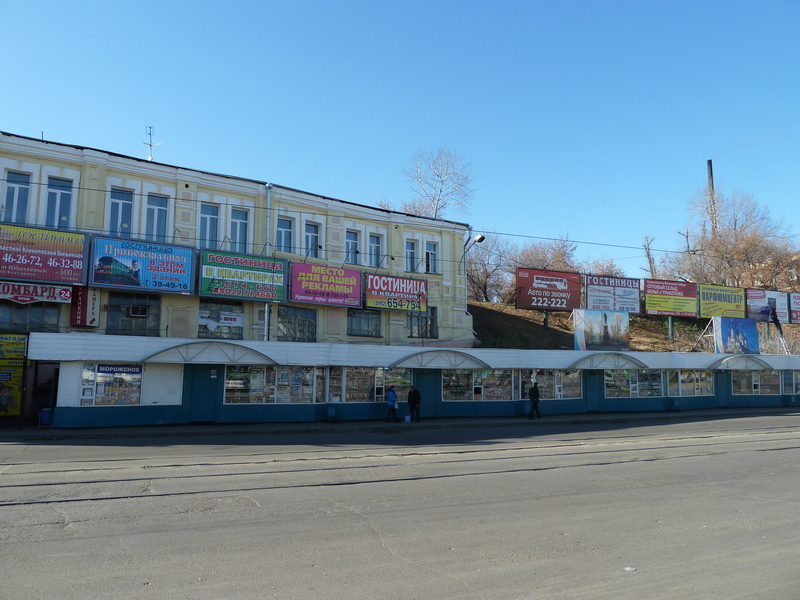 The taxi driver went around the block a few times, said something in Russian and then took me back to the abandoned shop, pointing at the number 27 on the wall – the number given on the website. Bemused, I paid him, got out and went to a mobile phone shop nearby. I was told it was down past the Metro station, so I walked for 10 minutes past there. Realising I wasn’t getting anywhere, I asked at a Pizza Express – where a waiter told me I’d gone the wrong way and to go back where I’d come from. I trudged back and then asked a doorman at a hotel, who told me to go back on myself and then turn left. So I did, and still couldn’t find it. I showed my laptop page to another doorman at a bar, who seemed really helpful – and then directed me back to where I started in the first place. This went on for about an hour, and by now my back was aching and feet were hurting. I asked two more shopkeepers, pointing at my laptop, each gave different responses. I’d started to wonder if I’d ever find the place, and with tiredness creeping in at about 12.15am, I knew I needed to find it sooner rather than later. After walking right along the street, and obviously looking lost, another taxi driver asked me where I was going. 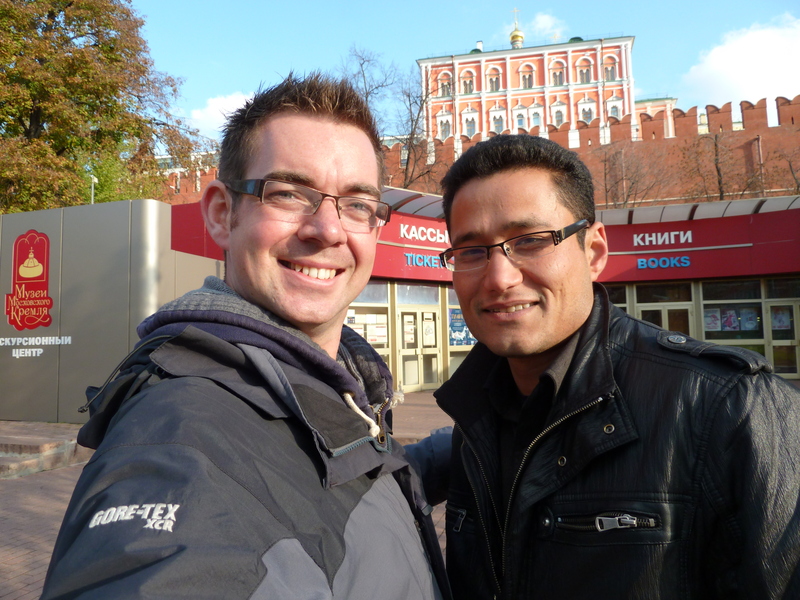 He was brilliant – we agreed a price and he agreed he’d help me find the hostel. He took me to exactly where the first taxi driver dropped me off! After a bit of searching around the back, it turned out the hostel was an apartment high up in the block above the shop. The taxi driver rang the buzzer, a door opened, and in I went. At 1am, I’d obviously woken up the guy that runs the Eesti Airlines Hostel, but I was just relieved to be able to drop my bags and sit down on a bed. I noticed a familiar smell in the room – the same I had noticed on the train and in the taxi. Then I saw the front of my rucksack was wet and foamy…thanks to a split bottle of Lynx shower gel. Explained a few things! I woke up at 9.30am on Tuesday. 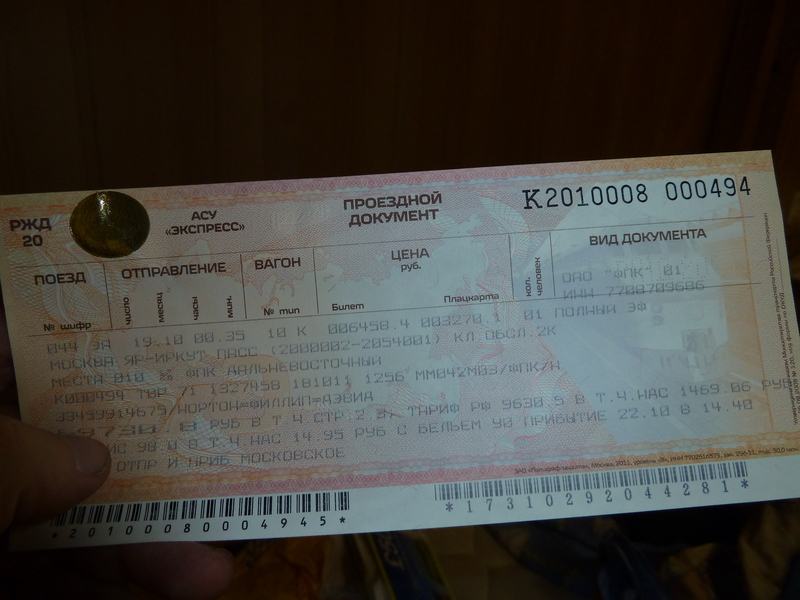 My priority was to find the station to buy tickets for the trans-Siberian train that leaves that night, train number 4. 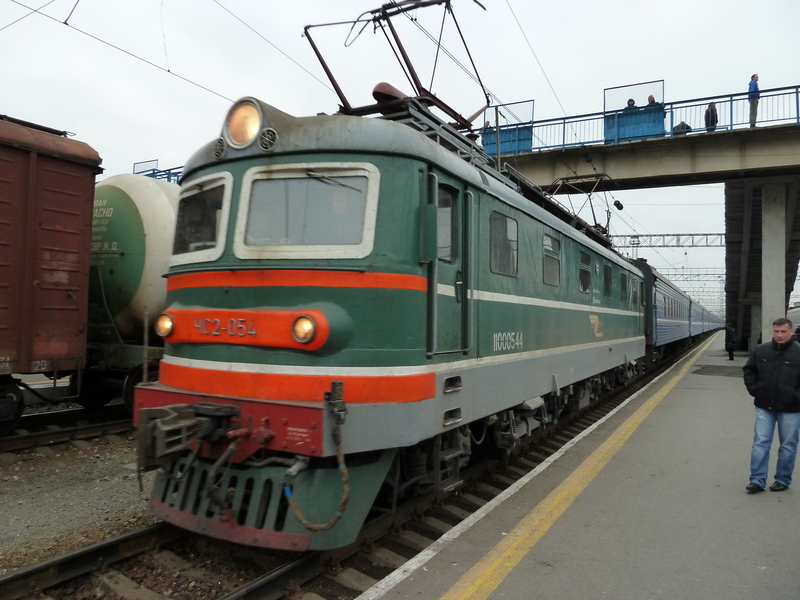 It’s the one direct train from Moscow to Beijing that leaves every week, and according to my research, usually had quite a few Westerners on it doing the same as me. I knew I had to stop somewhere with a Mongolian embassy, so decided that Irkutsk was the best place to stop off. 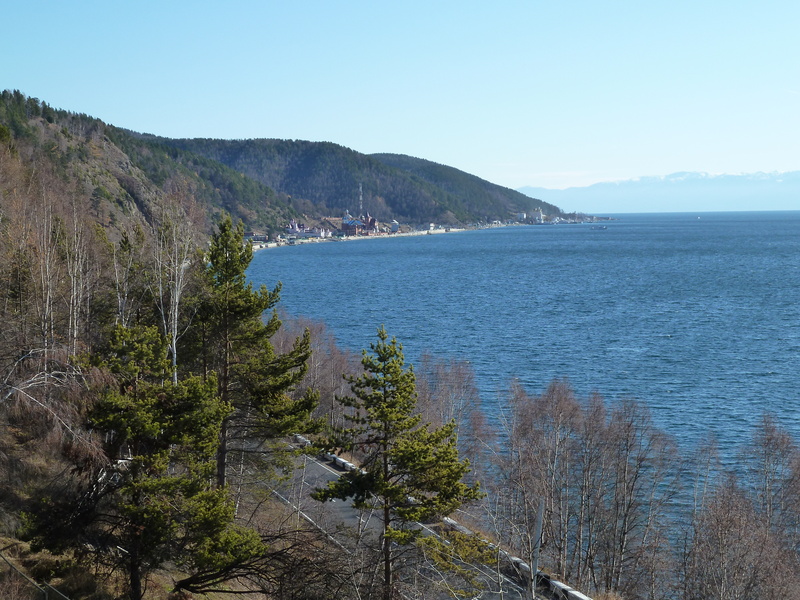 Its near the worlds largest lake, Lake Baikal, and everything I read seems to say its beautiful. 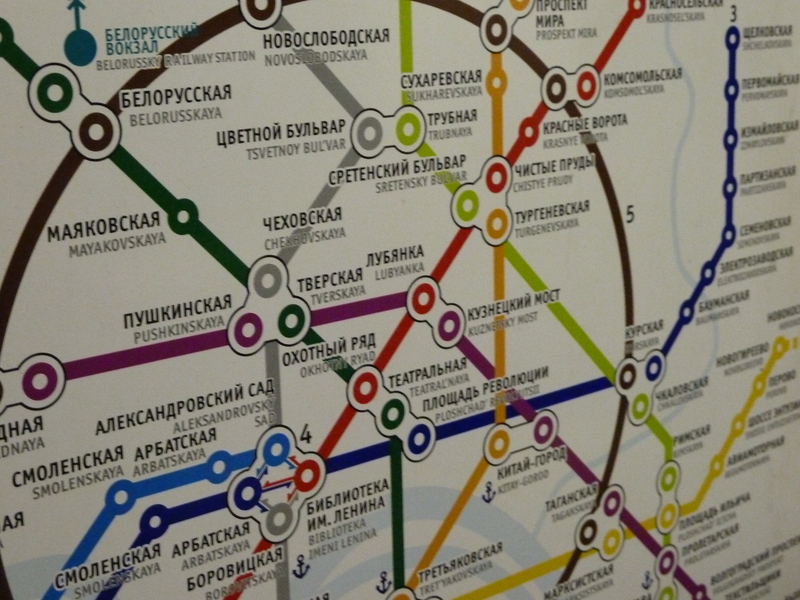 I somewhat more successfully navigated my way around the Metro to the mainline Yaroslavsky Station, and queued to buy my ticket. The attendant did not know any English, so thanks to the brilliant Trans-Siberian Handbook I’ve got, filled in one of its forms which gives all the information they need. 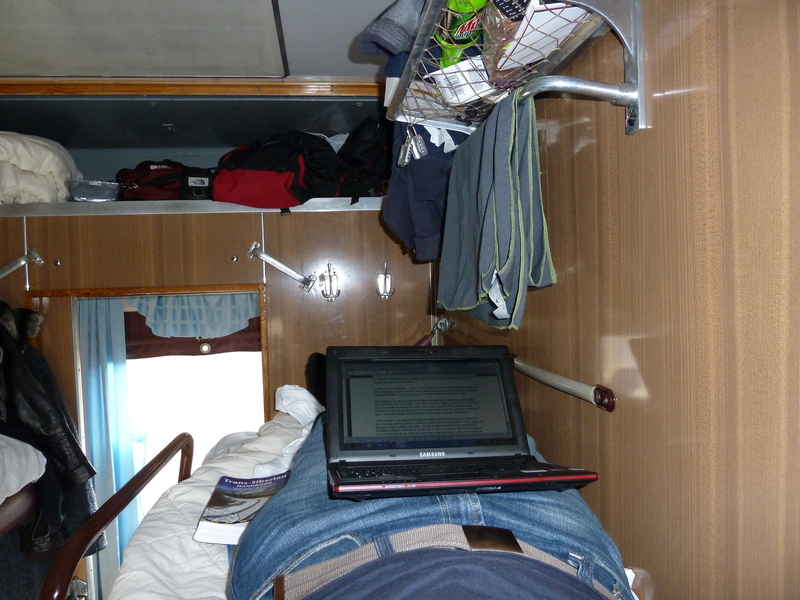 Unfortunately, the train to Beijing only had third class left – and after watching Karl Pilkington on An Idiot Abroad make the same journey in third class on television a few weeks ago, I knew ‘sitting on a shelf like an ornament’ wasn’t for me! Instead, I was told there was a train the next day, and asked if I wanted to go in the day or at night. I asked for the night one, giving me an extra day in Moscow, showed my passport, paid 9,800 Roubles (about £200) and that was it – I had a ticket in my hand! 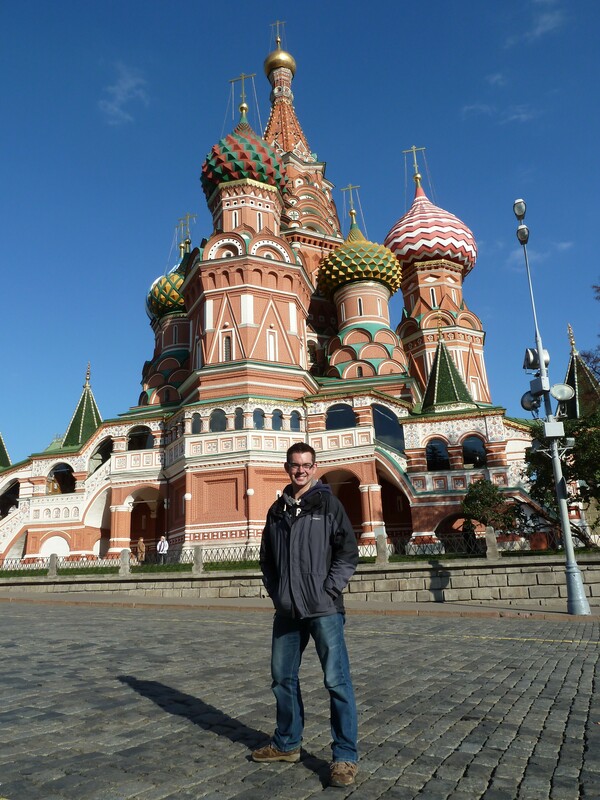 Now it was a case of taking in the sights – first stop was of course Red Square and the Kremlin. They were really busy areas, and there was some sort of Festival of Light being set up, so Red Square was full of lighting pylons and a huge stage in front of Lenin’s Mausoleum. 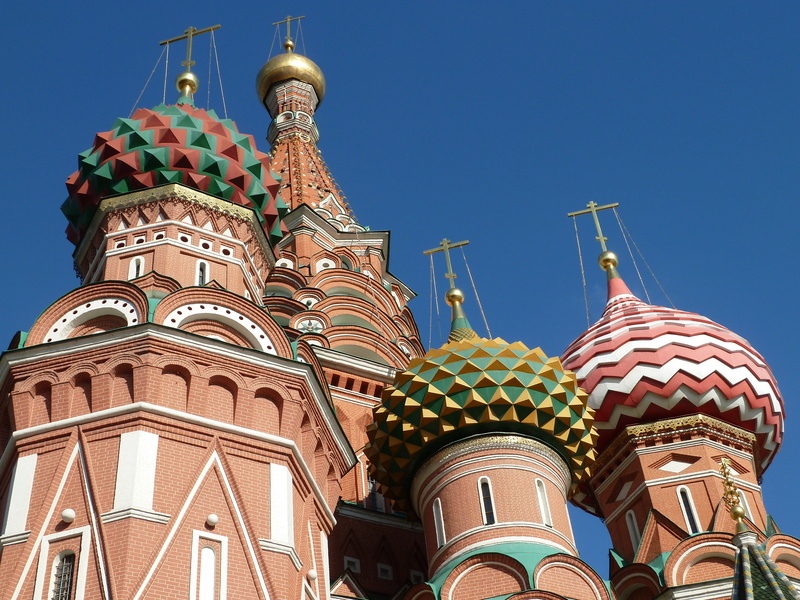 It spoilt the view a bit, so I headed down to St Basil’s Cathedral, more commonly known as ‘that funny church’ because of its colourful and oddly shaped domes. Its an extraordinary building, and I walked around to get the sun in the right place for the photos. I sat down opposite the cathedral to have some lunch. I’m still making my way through Saturday night’s Dominos pizza that I’d ordered in when I was busy trying to fix my phone. It came close to being thrown out, but Dad wrapped it in foil for me and it had kept pretty well. Two slices later, and I made a move for a nearby shopping centre called Gum, highlighted for its spectacular glass roof. With its range of D&G, Hugo Boss and Ferrari shops, it was hardly Princes Quay…but its glass roof was fairly nice! 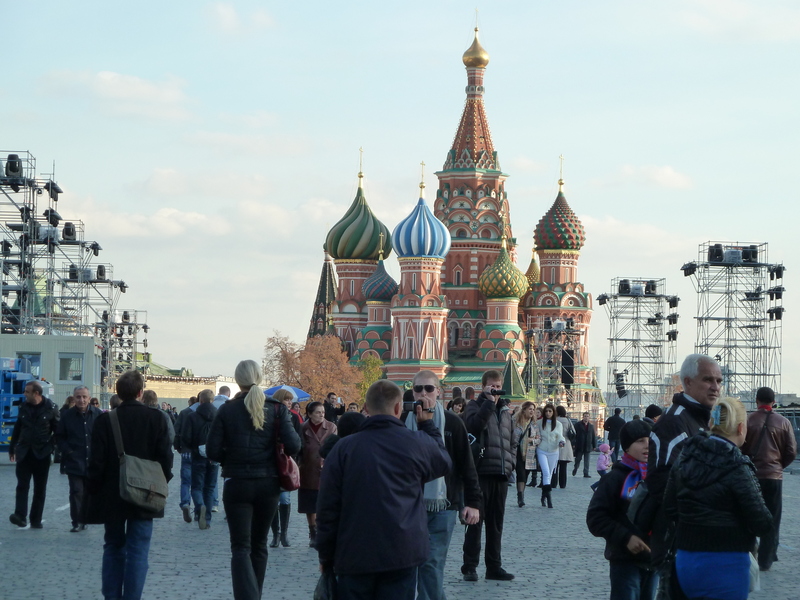 I had a look around inside the Cathedral – which to me, felt more like being inside a dolls house than a church – and then strolled back through Red Square. 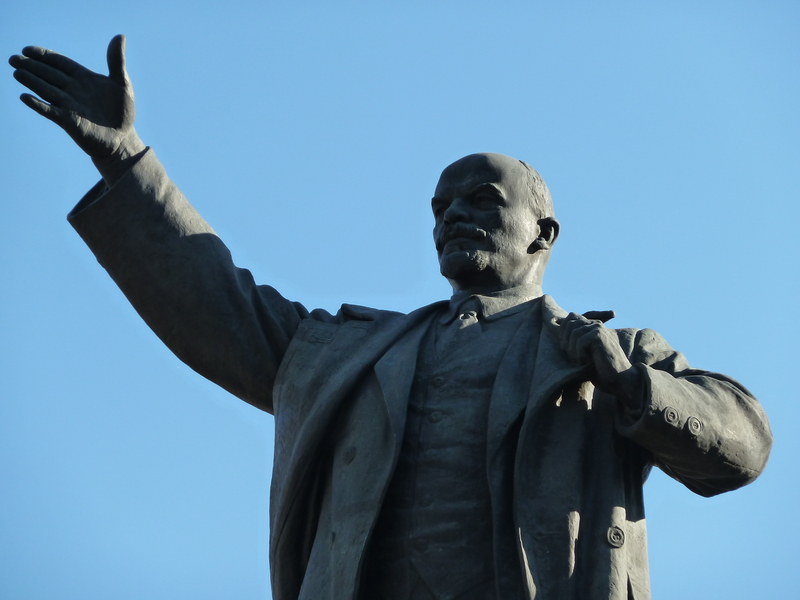 My fact of the day is that the name Red Square has nothing to do with the country and communism – instead, its all down to the original cobbles which were once laid there. The red cobbles were ripped up years ago when a smelly, dirty market was condemned, and replaced with the present grey cobbles. I kept having to make double-takes everywhere I went. 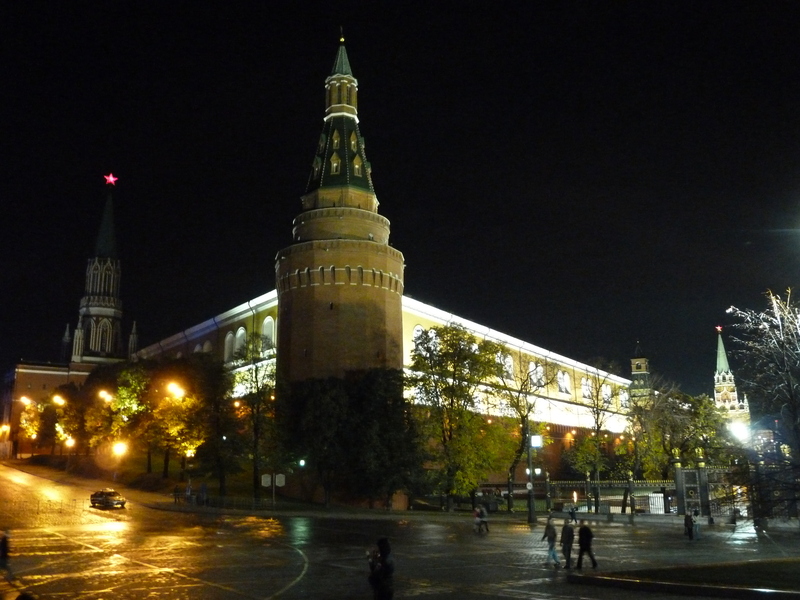 I made my way to the main entrance to the Kremlin, stopping by at the tomb of the unknown soldier and the eternal flame beside the Kremlin wall. Its guarded by soldiers from the Russian Army, and at the changing of the guard, Basil Fawlty’s ministry of funny walks did spring to mind! I went to buy a ticket to go inside the Kremlin, but despite the guide and the ticket window saying its open until 4.30pm, it was closed. A man walked up to me and asked if I could understand why it was closed – I obviously had no idea, but we walked up to the main entrance together. His name was Husanbay, a 31 year old from Uzbekistan. He’s living and working in Moscow as a Chinese teacher, but has a wife and daughter back in his home country. He’s trying to get into international relations, but needs to study first so is saving money to get into a college somewhere. He was good fun, and had really good English, and we seemed to get on, so we walked around together talking about our lives back home and the places we’ve been – or in Husanbay’s case in particular, the places he’d like to go. 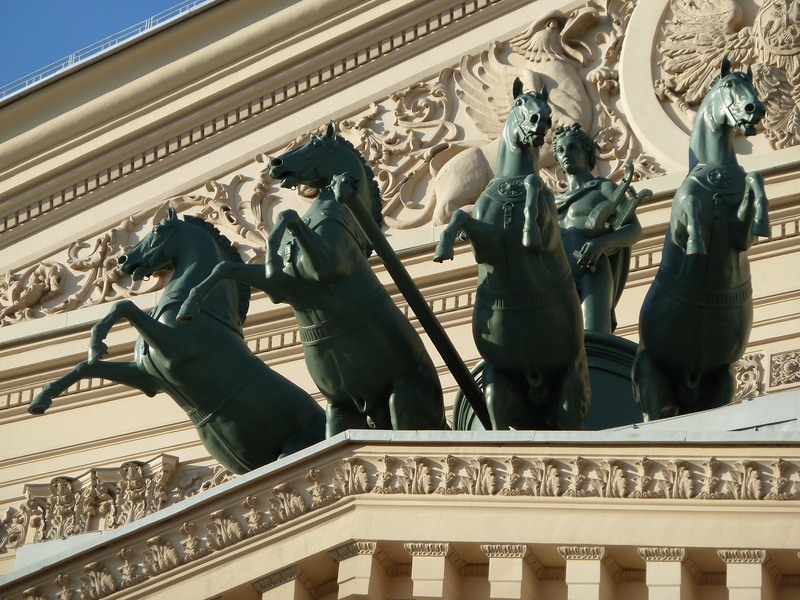 We wandered to the Bolshoi Theatre and marvelled at the detail on the outside of the building, its huge pillars and the statues of the horses and of Karl Marx outside. Without my panic of the night before – and the weight of my bags – it was a much nicer experience to take it all in. 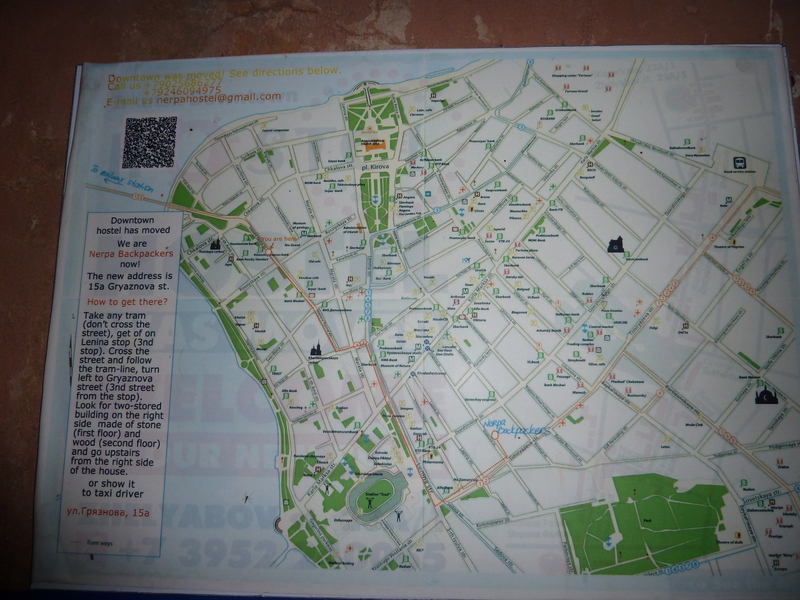 We then walked looking for the former headquarters of the KGB, and there was supposed to be a museum about it there too. We found neither, and at around 5pm, headed for the Metro. 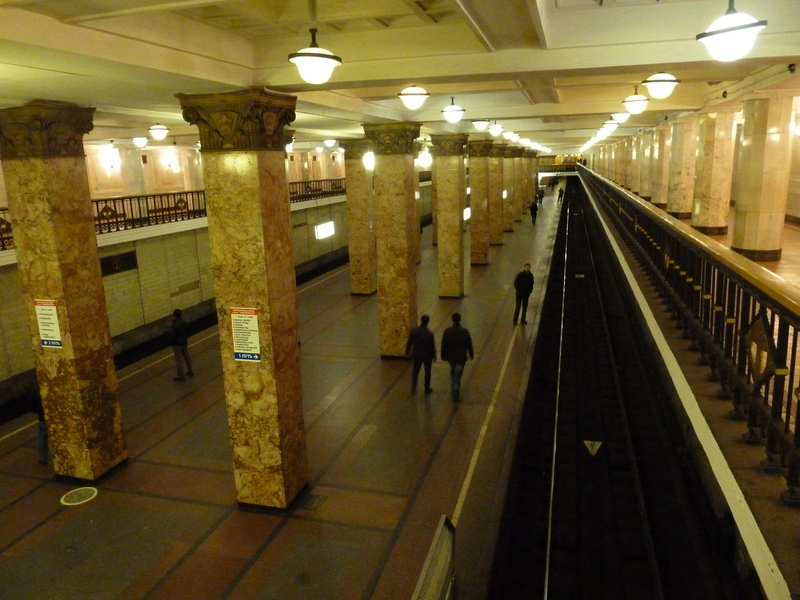 It was interesting to see that Husanbay, despite living in Moscow, also struggled with navigating around the underground system! We swapped email addresses and gave him my website details, before saying our goodbyes. We’d spent a good few hours together, getting to know one another, and I wished him all the success for the future before he jumped on his train and disappeared into the tunnel. Back in the hostel I decided to double check my train tickets. The train leaves at 00:35 on the 19th of October. Today, was the 18th. 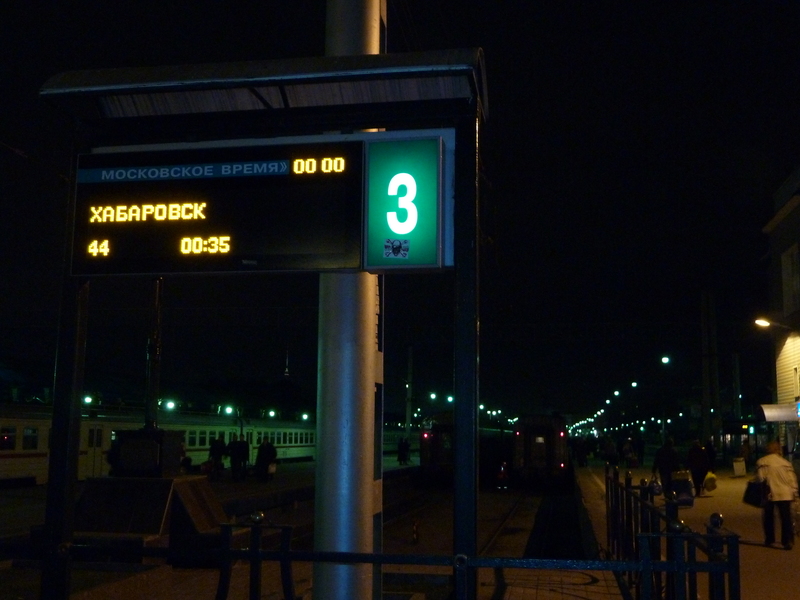 I suddenly twigged – half past midnight means the train leaves in just a few hours time, and I didn’t have another day in Moscow after all. I had to get my things packed again, bought provisions for the journey, and said goodbye to the guys I’d met at the hostel. They were a bit bemused by how I’d turned up after sightseeing saying I was staying an extra night, and then suddenly I was packing up and getting ready to go. I explained what had happened and they laughed. Im just pleased I decided to double check – I’d have looked a right fool turning up 24 hours late for a train! Speaking of which, I’ve got a train to catch…better go! Stop the world…i’m getting on! So here we are then, I’m on a plane to Moscow after probably the most hectic, stressful, and emotional weekend I think I’ve ever had. Only a few days ago, I was filming Star Trek fanatics as they try to teach the world to speak Klingon. Backpacks and mosquito nets were a million miles out of my mind – partly because somebody was trying to teach me how to say hello in a made-up Trekkie language. It was soon Friday, and it didn’t feel real saying goodbye to colleagues and good friends in the Look North newsroom. My day-to day life, the normality that I love, the routine of pottering along Spring Bank to the BBC and arriving late for the morning meeting. Of publishing a story far too close to its slot, driving producers and directors crazy. Of stopping by at Tesco to pick up something for tea. Watching the series-linked Coronation Street (yes, im sure this blog will turn out to be revealing!) Everything I have known for my six years in Hull was about to come to a clattering halt. Life on hold…for now. Today was a sad day too – my best mate, former housemate and all round good badger Matt was also leaving the BBC, but unlike me, he wasn’t returning anytime soon. Bagged himself a well-deserved gig at Sky News didn’t he, and quite strange –but quite fitting – how it worked out our last day would also be together. 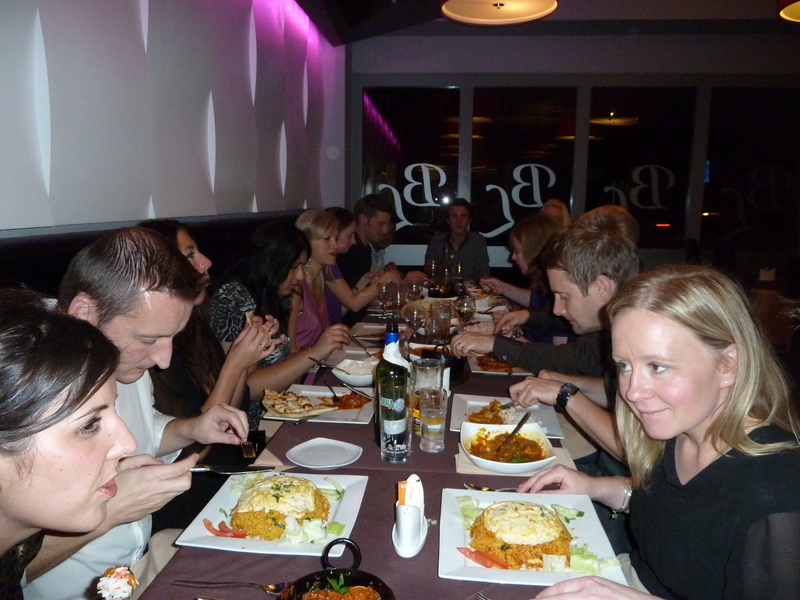 With formalities over, it was across to the Rugby Tavern for a drink with those who couldn’t make our leaving meal, and then on to the Bengal Lounge on Princes Avenue for curry and beer. There were 23 people who thought we were worthy enough of a send-off – either that, or to make sure we actually went, one of the two. Oh, and I know the exact figure as I had to work out the bill at the end. The plan had been to go to Pave and then on to Sugar Mill. That plan changed when my mate Rich Mcelvanney helpfully declared my house as a venue for drinks – as if I didn’t have enough to do, let alone clearing up after a party!! However, it was a great night, good to chill, have a laugh with some good friends and ponder as to how I was going to wake up at 6.30am to complete one of the first major parts of bringing life to a stop – taking my car back to the finance company. I found myself talking to it as I drove along the M62 to Leeds at 8.30am, reminiscing about our journeys together as if it was an old friend. The highlight for me – and im sure the car – was a tour around Europe and France last year, a trip taking in Paris, the Alps and the Normandy beaches. Yet today, stripped bare of all my belongings and rubbish which made it my car, I was abandoning it at a car auction site off the M1. In a sea of cars, mostly heading back to financing companies for what I imagine are whole variety of reasons (and im sure many wont be happy stories) there was mine. It needed a whole load of work doing to it if I’m honest, but it had looked after me and kept me safe. The only tell-tale sign of its past, getting me from story to story? A BBC Radio Humberside car sticker in the back window! Now things had changed. Without a car, and on a train back to Hull, life had started to change. The house needed sorting out so my new housemates had somewhere to live, packing needed to be started, insurance needed finalising. And then I was hit with what’s likely to prove a major issue for me – my iPhone died. I decided to upgrade to the new i0S 5 operating system through iTunes, except it wiped out all my phone coverage. I had been trying for weeks to get o2 to unlock the handset so I could use foreign sim cards inside it, but for one reason or another, they couldn’t do it. Apple were being most unhelpful too, saying I had to pay as it was out of warranty. To cut a long story short, I was advised by o2 to ‘jailbreak’ the handset online, and unlock it from the network that way, especially now it was unusable anyway on their own network. With time already against me, I spent the entire Saturday night, the day before departure, frantically learning how to hack my phone in a desperate attempt to make it work. Getting to bed at 1am, then back up at 6am to have another go, there was a glimmer of hope. It detected a network, and it was unlocked – except I’d lost wifi capability. So I tried the process again, following instructions on the web, and promptly lost the entire contents of the phone. It overwrote my contacts in the iTunes backup file, all my texts, notes, apps, music – the whole lot. By mid morning, and with a train at 4.40pm that afternoon, I still had little in the way of packing done, and my only means of communication with my parents was through Skype. An hour later, after sensing and seeing my panic, they were at my house to help out. I had to abandon the idea of fixing my iPhone, and face up to the fact I’ll have no music, no maps, no ability to call, no emails on the go, until I can get something sorted somewhere. Instead, Mum and Dad went out to the phone shop to get me a cheap handset, so I can at least make calls, and then in what was a mad four hours, helped blitz the house in one of the biggest clear-outs/tidy ups its ever had! A hug for mum after all the help! Cut off from friends, it was really nice to have a visit from Matt Richards and Andrew Billington who popped round to see how I was getting on. It was ten minutes before the taxi was due to arrive, and they were met with cardboard boxes and allsorts being thrown out of the front door and into an army of bins, one of which I’d had to borrow from my friends house down the road. If im honest, it was chaos at the time, but it was really thoughtful of them both to come and see how I was getting on, and I really appreciated it. Setting my house alarm and locking the door to my house was one of those moments when I felt the nerves kick in again. It was another point of realisation that I’m stepping out of my routine and throwing myself into something completely different. I put the bins out –its bin day on Monday – which was probably one of my last chores for a while, then it was to the station. Mum and Dad’s TT can’t fit three people in, let alone all my backpack and luggage I’d manage to somehow gather together in time, so there was a taxi involved. When I got to the station, it began to dawn on my how much I needed the iPhone – I couldn’t get the ticket booking reference for my train, as it was on an email…on the phone. Thankfully, the lovely Samsung netbook im writing this on that the folks bought me began to prove its worth – although it involved a dash to the Royal Hotel to steal a wifi code! Saying goodbye to mum and dad was sad. We’d had such a hectic day, I really wanted to spend a bit of time with them, but hadn’t. We had five minutes to wait before the train arrived to take me to Doncaster, and then London, and that’s when it started hitting home. I know they’re worried sick – and will be worried sick – until I arrive back home next year. However much I tell them I’ll be fine, I know it does little to help. 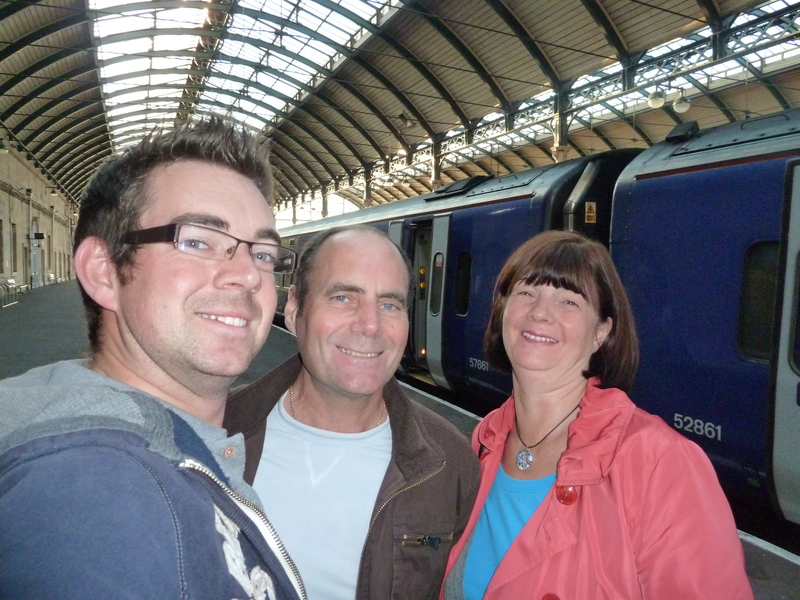 We had a few photos together, to mark the official start of my travels, and that’s when I had to get on the train. It’s a weird feeling knowing you wont see each other for so long…and I’m not ashamed to say there were a couple of tears. And that was it – I was on my way. 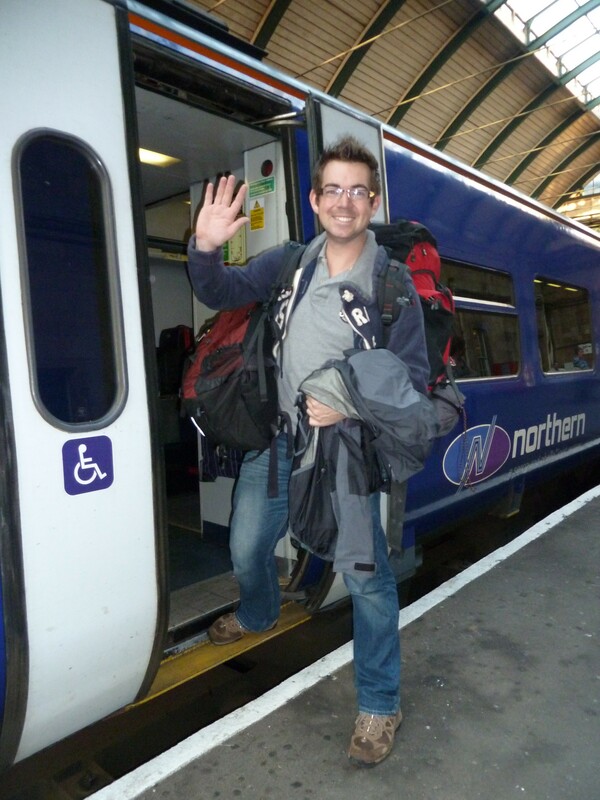 The first leg around the world on a busy two-carriage Northern Rail service to Doncaster. A journey I have made so many times, but not always with such a distant destination. It was a beautiful early evening, the sun was setting and glinting off the water as we passed under the Humber Bridge. I looked up at the north tower, knowing it will be at least seven months before the sight of it welcomes me home again. The East Coast segment to Kings Cross was helped by my bargain £25 First Class ticket, and made full use of its free wifi thanks to Dad Skypeing me. He enjoyed his look out of the window at Stevenage, so much so as the train stopped and went quiet, he jokingly shouted ‘hello Stevenage’. I had some funny looks from the other passengers, who’d obviously paid substantially more to try and avoid that type of behaviour, as it boomed out of my laptop! I was able to switch off a little in London, thanks to a trip to a restaurant in Chinatown and a few drinks watching a fantastic band in O’Neills in Leicester Square with my friend Robyn. They did loads of covers, but they were good covers – Franz Ferdinand, Oasis, Greenday, even a rock version of an Abba song. I great night, and good Guinness! The next morning was when the iPhone loss delivered another problem – the cheap handset alarm didn’t go off at 8.45am like I asked it to. Instead, it was almost 10am, leaving less than three hours before my flight left Heathrow. I had planned to take the cheaper Piccadilly Line option to get there, but time meant the only way I had a chance was the £18 Heathrow Express from Paddington – and even then it was cutting it fine. The Tube was painfully slow, but somehow made the 11.50am train. Bearing in mind the flight was at 12.55am – and they usually start boarding half an hour before – I knew it was cutting it fine even by my standards. I ran through Terminal 5, and a check in agent sent my backpack through. I sprinted to the queues of people waiting to get through security, waited my turn, and that’s when panic mode kicked in. Lots of red flashing lights, and asked to see the airline. So I did – and my bags were being unloaded. I went back to the check in man, and he was brilliant. I’ve seen this sort of thing happen on the Airline or Airport programmes, and sat at home muttering how they should have got to the airport earlier etc.. A couple of phonecalls from his desk, and he punched his fist in the air. I presume it was a celebration, and not a bad aim at my chin, as quickly I was being rushed through security and to the gate. I was actually there in plenty of time in the end – but I was probably the biggest, sweatiest mess of a passenger on the flight!